The Amelia Island auction week opened up with Bonhams on Thursday and its experience foreshadowed what would follow, difficulty in closing the deal on major lots but general success, even if at modest values, with moderately-priced lots. 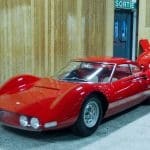 Just five lots achieved hammer bids over half a million dollars and only two of those, the headline Ferrari 250 GT Europa and antique Pierce-Arrow 48, were sold. 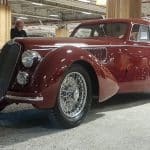 Also not to be overlooked was the effect of Bonhams’ highly successful auction in Scottsdale in January and its major sale at the Grand Palais in Paris in February. A few high dollar cars from either or both those venues offered at Amelia would have had a major effect on Bonhams’ sale total here. 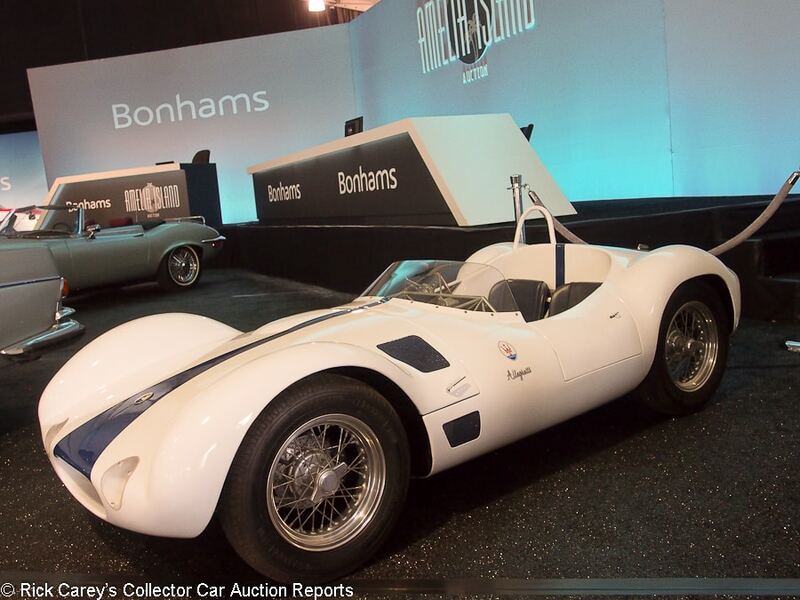 53 of the 72 lots in Bonhams sale were offered without reserve, a preponderance of guaranteed sales that is apparent in the auction’s sale rate of 83.7%. Despite having a field of just 72 lots Bonhams was perhaps the most diverse auction on the island with offerings from a Brighton Run veteran 1904 Knox to one of the ubiquitous Porsche Carrera GTs. 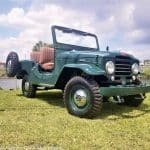 It also presented the best trucks in the Daimler Ferret scout car and absolutely pristine Toyota pickup along with two of the also-ubiquitous Toyota Land Cruisers. The Tipo 61 Birdcage Maserati in the lead photo looks real, doesn’t it? It’s a 3/4 scale running, driving replica with Benelli motorcycle engine power reputedly capable of 30mph in the hands of a very fortunate kid. It sold for $47,500, more than enough to buy several real cars in the auction, but more fun than most of them. Note: This report’s format is an experiment. the most quickly available cars (the ones I looked at) are published first. A batch from Andrew Newton will follow later, but those cars are included as results and photos only in the initial listing. Note 2: 3/20/17 The reports have now been updated using this font size to be easily differentiated. Lot # 101 1959 Berkeley Sports 492 Roadster; S/N 74; Engine # 190; Beige, Maroon stripe/Maroon vinyl; Estimate $25,000 – $35,000; Cosmetic restoration, 3 condition; No Reserve; Hammered Sold at $15,000 plus commission of 10.00%; Final Price $16,500 – Centerlock wheels, Michelin tires, 492cc/30hp Excelsior 3-cylinder two-stroke engine with triple Amal carburetors, drum brakes. – One of 666 built. Represented as restored, but that must have been a while ago. Cracking paint around hinges and gaps. Grille is a little dirty. Some oil here and there in the engine bay. Right rear wheel lobe is bent. Some paint issues in the stripe. Cracks in the steering wheel. Loose wiring held together with electrical tape. Restored to a reasonable degree, but certainly not ‘show ready’ like the catalog says. – Sold by Auctions America at Ft. Lauderdale in 2012 for $16,500, then at the same venue a year later for a whopping $27,500. 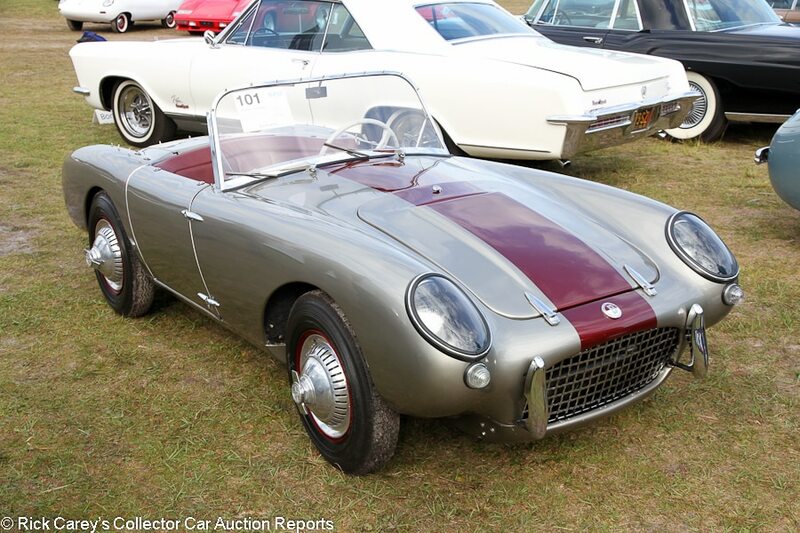 With two-stroke motorcycle power and front-wheel drive, the Berkeley is certainly unconventional, and it is one of the few sports car that can hide behind a Bugeye Sprite. While quite rare, it was one of the cheapest cars on the island all week, selling for a roughly appropriate price for car in this condition. 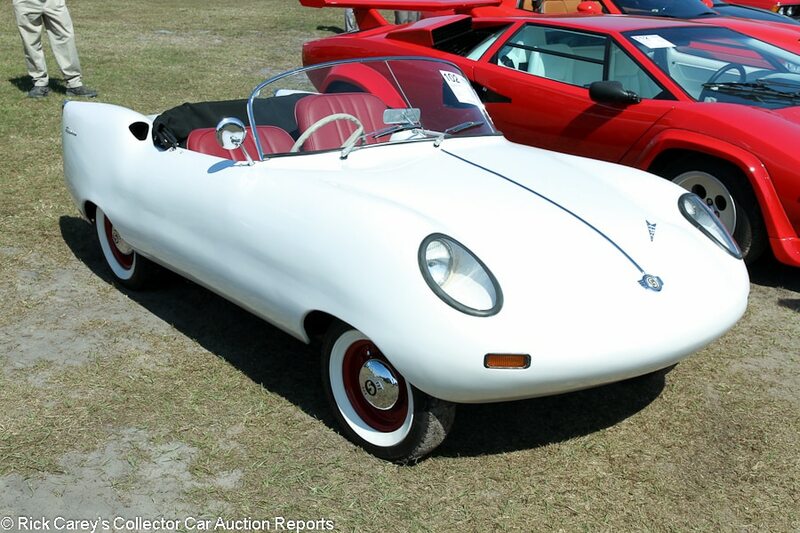 Lot # 102 1959 Goggomobil Dart Roadster; S/N 0112854; Engine # 02130120; White/Maroon; Black cloth top; Estimate $30,000 – $40,000; Visually maintained, largely original, 3 condition; No Reserve; Hammered Sold at $29,000 plus commission of 10.00%; Final Price $31,900 – RHD. 392cc/20hp, 2-cylinder two-stroke engine, red steel wheels, hub caps, whitewalls, top but no side curtains. – Wavy body sides. Replacement upholstery. Trim doesn’t fit. Worn switchgear and steering wheel. Bodied in Australia on top of Goggomobil mechanicals. One of 700 built. Not totally original, but not restored, either, just made presentable. – A strange vehicle but definitely a cute one, with boat-shaped fiberglass body, wraparound windshield and covered headlights. The cute factor helped enormously with the price it brought. 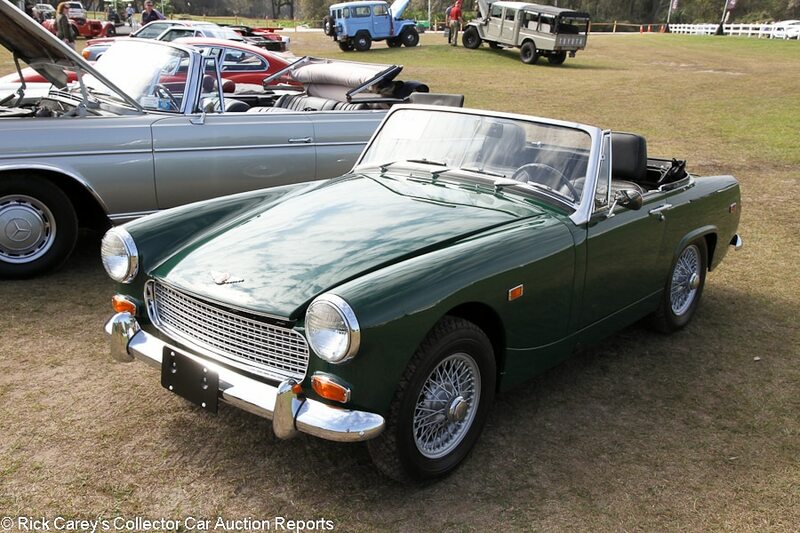 Lot # 103 1969 Austin-Healey Sprite Mk IV Convertible; S/N HAN9U84386G; Engine # 12CDDAH19186; British Racing Green/Black vinyl; Black vinyl top; Estimate $25,000 – $40,000; Visually maintained, largely original, 2- condition; No Reserve; Hammered Sold at $18,000 plus commission of 10.00%; Final Price $19,800 – Painted centerlock wire wheels, Michelin tires, heater. – Represented as all original. Tidy but used engine bay. A handful of chips in the wheels. Nearly spotless underneath. Small scrape in the rear bumper. Interior looks new. Looks like a two-year-old car. Cheap cars are often beat up and driven hard, and Sprites are some of the cheapest, making this one remarkable and probably one of the best original square body cars around. – Not sold at Branson Fall in 2012 at a high bid of $10,500, and values haven’t done much since then. The new owner of this car can probably say he has the very best unrestored square-body Sprite around, but he paid crazy money (in relative terms) for those bragging rights. 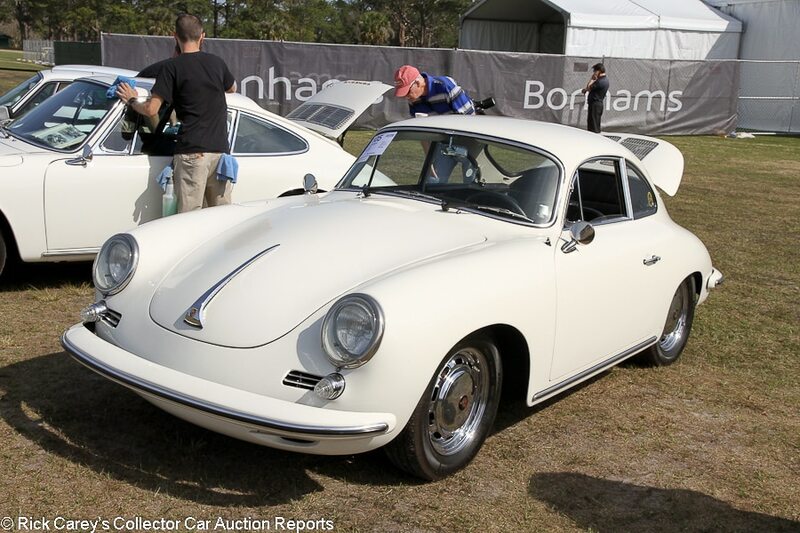 Lot # 105 1965 Porsche 356C Coupe, Body by Karmann; S/N 221823; Engine # 752590; White/Black leatherette; Estimate $65,000 – $85,000; Modified restoration, 2- condition; No Reserve; Hammered Sold at $40,000 plus commission of 10.00%; Final Price $44,000 – 1730/115hp, Michelin tires, dual Webers, VDO dash clock, Blaupunkt stereo, dual mirrors. – 912-spec engine. Chromed fan shroud. Very good paint and interior. Clean underneath. Porsche badges on the wheels are a little beat up. Done to good but not concours standards, which is just fine. With the later spec engine and Webers, it disregards authenticity in favor of driving and enjoying. – This kind of money ordinarily buys a project car in the realm of 356Cs. Instead, it bought an attractive car that has the wrong engine but is quicker and more fun than it ever was new. Some purists might turn their nose up at it, but for somebody who wants a 356 for fun this is a solid value with today’s inflated Porsche prices. 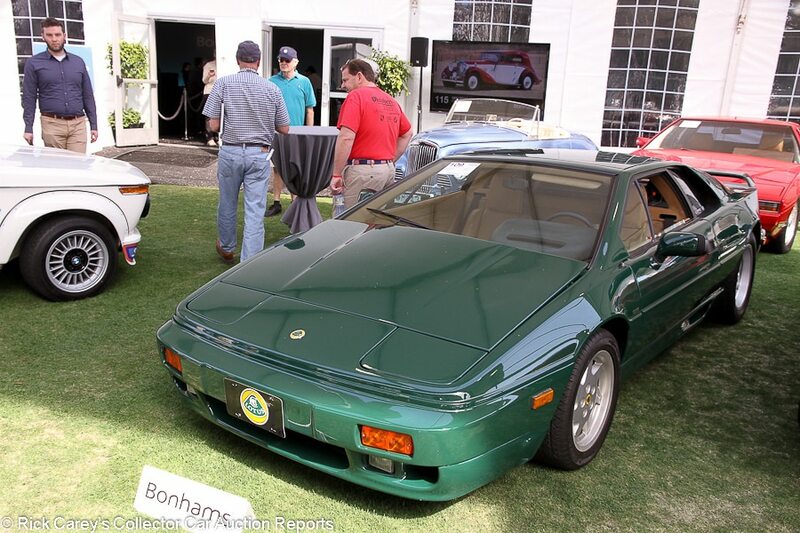 Lot # 109 1990 Lotus Esprit Turbo SE Coupe; S/N SCCFC20B2LHF65517; Engine # –; British Racing Green/Tan leather; Estimate $30,000 – $40,000; Unrestored original, 2- condition; No Reserve; Hammered Sold at $29,000 plus commission of 10.00%; Final Price $31,900 – OZ Ruote wheels, Dunlop SP Sport tires, Alpine CD stereo, power windows, air conditioning. – Four-owner car. Very good blemish-free paint. Seats and door panels are a little wrinkled. Really a great example with wear corresponding to the 9,408 miles. Full service history. If you can’t afford a really good Esprit, you can’t afford an Esprit. This is the way to buy one of these cars. – While values for the equivalent 911 or Ferrari have long since appreciated past the realm of affordability for most of us, the Esprit has remained a relative bargain, and this result suggests that values for even really good Esprits aren’t going anywhere. 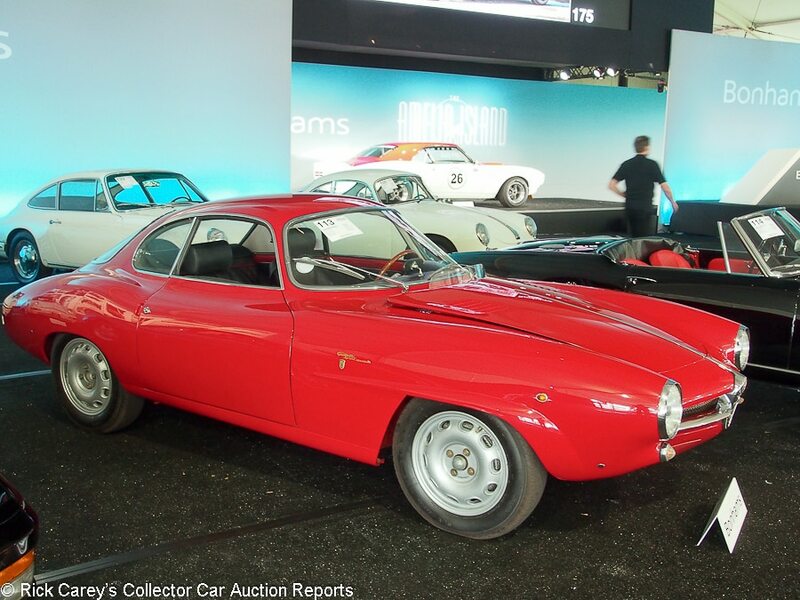 Lot # 113 1961 Alfa Romeo Giulietta Sprint Speciale, Body by Bertone; S/N AR10120177123; Engine # AR0012001562; Red/Black leather; Estimate $90,000 – $130,000; Modified restoration, 3+ condition; No Reserve; Hammered Sold at $77,000 plus commission of 10.00%; Final Price $84,700 – 1290/104hp tuned engine, 5-speed, silver painted alloy wheels, Avon tires, headrest seats, Nardi woodrim steering wheel, chrome headers, 4-point belts, upgraded suspension, no bumpers. – Good paint and interior on an older restored engine and chassis. Some overspray in the right front wheelwell. Engine is orderly but is used. An intriguing Giulietta Sprint Speciale with desirable upgrades for touring and high speed events, but not stock. – This is by recent standards a modestly priced Sprint Speciale but its value is compromised by the modifications, particularly the obvious ones, that make it a better driver than show car. The Bonhams bidders applied good judgment in settling on this price, but for a driving-oriented new owner this is a strong value. 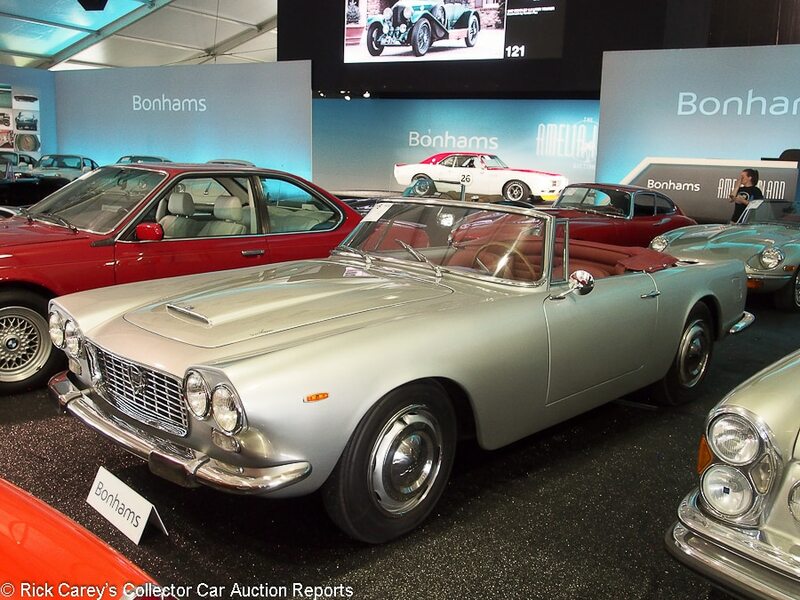 Lot # 116 1963 Lancia Flaminia 2.5 3C Cabriolet, Body by Touring; S/N 824142244; Engine # 8231014110; Silver/Burgundy leather; Black cloth top; Estimate $220,000 – $260,000; Older restoration, 2- condition; With Reserve; Hammered Sold at $177,500 plus commission of 10.00%; Final Price $195,250 – 2458/140hp, triple Webers, 4-speed, floor shift, woodrim steering wheel, steel wheels, hubcaps, trim rings, Michelin X tires, Carello lights. – Good paint and chrome, very good new upholstery and interior trim. Underbody has been done, then driven. Generally like 6-month old new car. Probably never fully restored all at one time, but sympathetically taken care of as it needed it, always to high standards, and in effect if not in actual fact the functional equivalent of an older restored and well maintained car. – It is impossible not to like this Flaminia 2.5 3C whether for its design, its performance, its condition or its rarity. It suffers a horsepower deficit to similar Ferraris or Maseratis, but is if anything more rare and besides, who flogs their Ferrari or Maserati to the extent needed to extract the extra hp? This is an appropriate result for this car but it is 1/4 to 1/10th the price, an astute purchase for a car that will be as welcome as its Italian counterparts on the Colorado Grand or New England 1000. 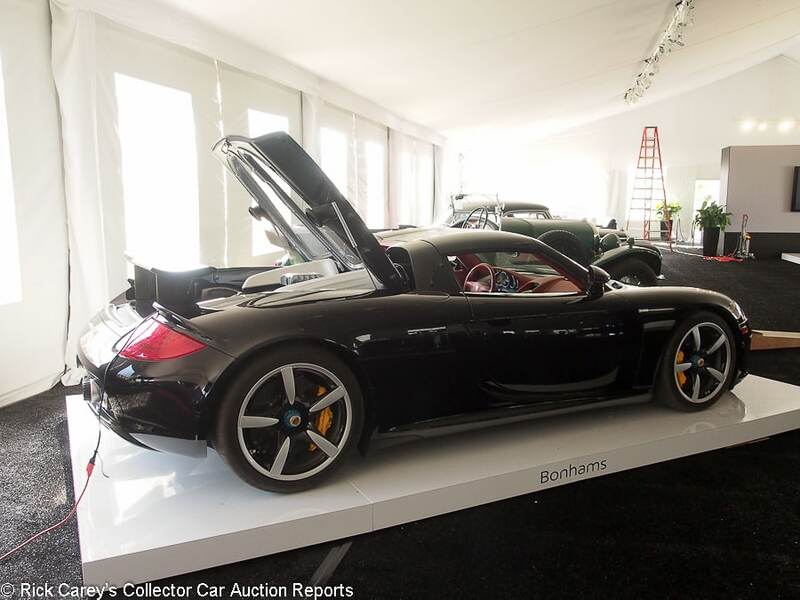 Lot # 117 2005 Porsche Carrera GT Convertible; S/N WP0CA298550L001164; Basalt Black Metallic/Terracotta leather; Estimate $600,000 – $700,000; Unrestored original, 2 condition; With Reserve; Not sold at Hammer bid of $520,000 – Yellow calipers, fitted luggage, air conditioning, CD stereo, body color wheels, all its original factory accessories, special order wide seats. – Represented as under 8,500 original miles and like new except for a lightly scratched driver’s seat bolster. – One of (at least) four Carrera GTs offered on Amelia Island this week, the 8,500 miles on this example weigh heavily on its secondary market value and were enough to offset the dramatic, rich and sumptuous colors. The value proposition is hard to judge in the context of so many Carrera GTs on the market and now the owner has a ‘shopped’ car to deal with. It would not have been a bad idea to cut it loose and see if the prospect of actually selling the car excited the bidders into upping the ante. 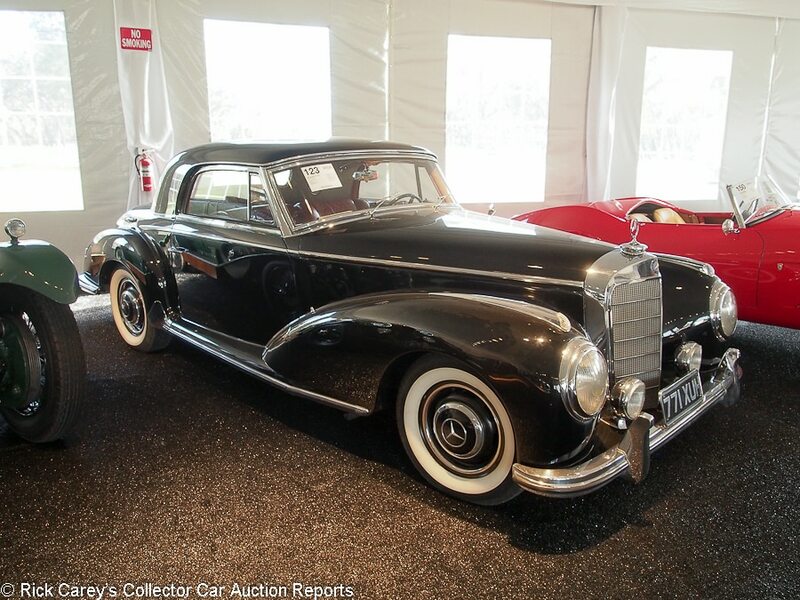 Lot # 120 1947 Rolls-Royce Silver Wraith Cabriolet, Body by Franay; S/N WVA63; Black, Brown fender sides/Maroon leather; Black cloth top; Estimate $200,000 – $300,000; Older restoration, 3+ condition; With Reserve; Hammered Sold at $220,000 plus commission of 10.00%; Final Price $242,000 – RHD. Fog light, skirts, hubcaps. – Represented as matching numbers engine. An older restoration that has been freshened several times. Sound interior. Decent chrome . Newer top. Scratches in paint. Attractive coachwork with wheel arch beads, chrome beltline moldings and delicate rear deck spline. – This old girl has been around for a long time in various colors and a variety of accessories. Her French coachwork has restrained style. Sold by Brooks Auctioneers at Monaco in 1998 in tired older restored condition for $88,631, she sold at RM’s Arizona auction in 2011 from Bill Jacobs’ collection in 2011 for $165,000, then at Barrett-Jackson in 2013 in the present livery (except for the recent fender side accents) for $220,000. At Worldwide’s Auburn auction in 2013 she brought $264,000, then sold at Barrett-Jackson in 2015 for $231,000. The seller should be extremely satisfied with this result, which covered the cost of the fender side overpaint. 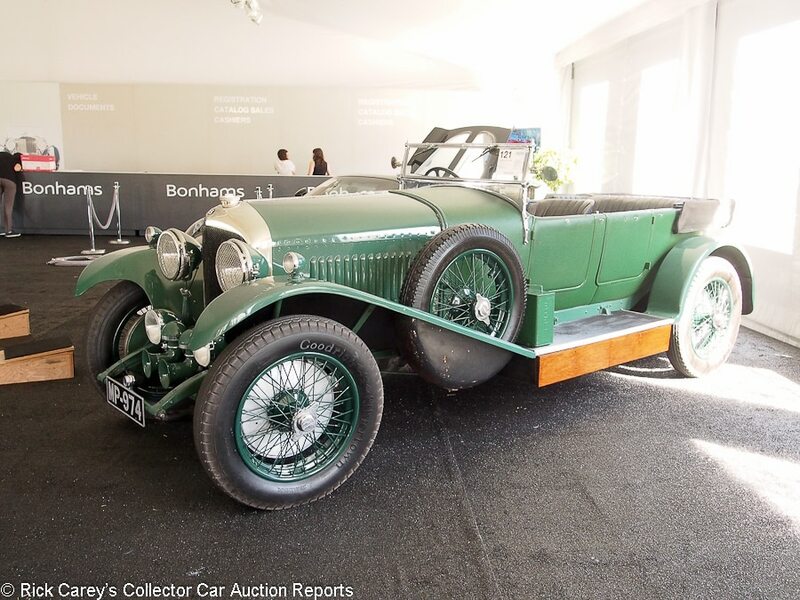 Lot # 121 1927 Bentley 4 1/2 Liter Touring, Body by Vanden Plas; S/N ST3015; Engine # MR3392; BR Green/Brown leather; Back cloth top; Estimate $750,000 – $900,000; Older restoration, 3 condition; With Reserve; Not sold at Hammer bid of $560,000 – RHD. Dual sidemounts, folding windshield, rear Auster windscreen, dual horns, headlight stoneguards, halogen driving lights, running board touring boxes. – Original body (with chassis number stampings), different engine although the original, ST3015, survives in another chassis. 6 1/2 liter rear axle, later 4 1/2 liter front axle in the original carrier Old but probably not original interior. Worn, repaired top boot. Sound but edge chipped old paint. Erratic chrome. A Bentley driver with many original features and even finish details. – The estimate range may have put bidders off when contemplating the number of replaced and upgraded components. It should not have. This is an unusually pure and sympathetically maintained Bentley 4 1/2 with its original Vanden Plas 3-door touring coachwork where today so many of its counterparts have been rebodied with Vanden Plas replicas. It is the real deal and is worth more than the reported high bid. The Amelia Island bidders overlooked an opportunity. 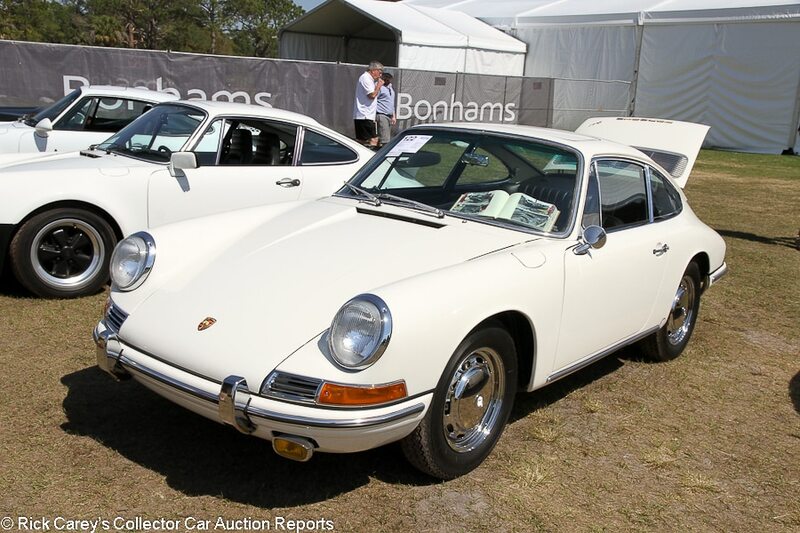 Lot # 122 1965 Porsche 911 Coupe; S/N 302527; Engine # 902677; Light Ivory/Black; Estimate $170,000 – $240,000; Recent restoration, 2 condition; No Reserve; Hammered Sold at $205,000 plus commission of 10.00%; Final Price $225,500 – Gold brightwork, sunroof, chromed steel wheels, dual Webers, VDO dash clock, tinted glass. – Matching numbers, represented as one of 42 sunroof coupes for 1965. Porsche CoA. Earliest history unknown. Recently restored from storage, where it was from the 1990s until 2015. Then taken apart and restored. Lightly scratched original side glass. Replacement windshield. Done in original colors. Looks just about new.A very strong and correct car. – The 911 market may be softer than it was only recently, but the best cars still command top dollar and this example certainly qualifies. The sunroof, with a nifty drain hole behind each window that distinguishes the earliest sunroof cars, added an appropriate premium. Lot # 123 1955 Mercedes-Benz 300S Coupe; S/N 1880115500020; Engine # 1889205500027; Black/Red leather; Estimate $400,000 – $550,000; Visually maintained, largely original, 3- condition; With Reserve; Not sold at Hammer bid of $315,000 – Hubcaps, trim rings, whitewalls, Becker Mexico radio, Bosch foglights, luggage, owner’s manual, parts book, tools, jack, copy build sheet. – Mediocre old repaint, weak chrome, original underbody. Sound but aged old upholstery, good refinished interior wood. Mechanically rebuilt since 2010 and electric power steering added (original steering column included.) – Sold by Bonhams at Rétromobile in 2008 for $216,701. That was Euros 149,500 at the time, which is about Euros 294,000 at this bid, seemingly enough to see it separated from its owner, even if it was paid in dollars in 2008. 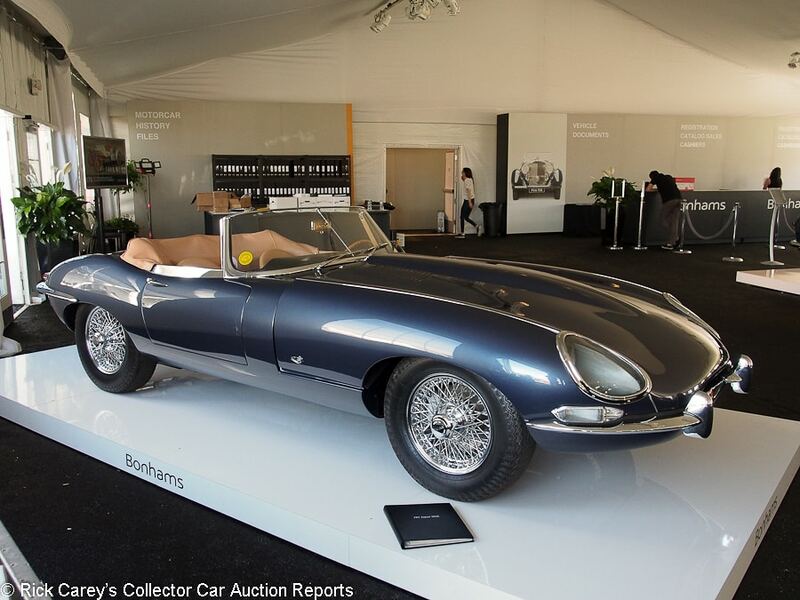 Lot # 125 1961 Jaguar XKE SI flat floor Roadster; S/N 875053; Engine # R11019; Opalescent Bronze/Beige leather; Grey cloth top; Estimate $350,000 – $425,000; Recent restoration, 2+ condition; No Reserve; Hammered Sold at $297,000 plus commission of 10.00%; Final Price $326,700 – Outside bonnet latch, welded louvers, chrome wire wheels, multiband radio, upgraded with 4-core aluminum radiator, brakes, Borg Warner T-5 transmission, JDHT certificate documented. – Represented as the original engine. Brilliant paint, chrome, interior and top. Done far better than new, faulted only by a faint wiper scratch in the center of the windshield. – Sold by RM here in 2011 for $154,000 fresh from restoration and still pristine today. The upgrades detract from its collector appeal but make it a much more usable and user-friendly car (for someone with small feet to fit into the constricted footwells.) The result here is realistic, but the owner got some bragging rights as only the 27th lefthand drive E-type with many early features. Lot # 127 1968 Pontiac Firebird Trans Am 2-Dr. Hardtop; S/N 7L141852; White, Red/Black cloth; Estimate $300,000 – $400,000; Competition restoration, 2+ condition; With Reserve; Not sold at Hammer bid of $230,000 – Holley dual quads, full rollcage, polished rim Torque Thrust style wheels, Goodyear racing tires, fire system, Kirkey seat. – Represented as the car raced by Jerry Titus in period, a Z/28 with Firebird body. Freshly restored with very good paint and chrome. Like a brand new Trans Am car. Monterey tech stickers carefully taped to the freshly painted rollcage. Unfortunately there seems to be scant period documentation establishing that this is ‘the’ Jerry Titus Firebird. – Sold by Russo and Steele in Monterey in 2010 for the same high bid. Without documentation, however, this is Camaro with Firebird panels, beautifully and meticulously restored and presented. It will make an impression in historic events and is appropriately bid at this result. 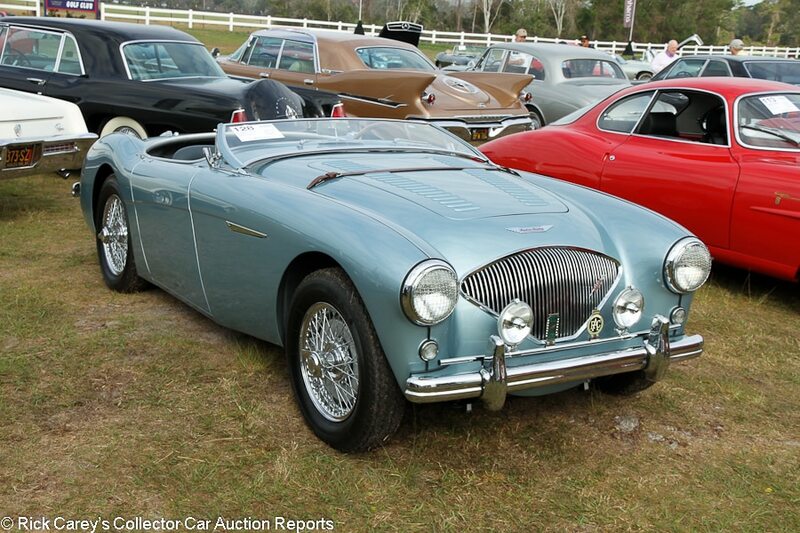 Lot # 128 1956 Austin-Healey 100/M Le Mans Roadster; S/N BN22L229678; Engine # 1B229678; Healey Blue/Blue; Estimate $90,000 – $120,000; Recent restoration, 2 condition; No Reserve; Hammered Sold at $100,000 plus commission of 10.00%; Final Price $110,000 – Centerlock wire wheels, Vredestein tires, Lucas driving lights, badge bar, headlight stone guards, woodrim steering wheel, heater, overdrive, Tag Heuer rally timer on the dash. – Fully restored. Numbers matching. Upgraded to M Lemans specs during its 2013 restoration by BMC Classic. Original colors. Very good paint, chrome and interior. Lightly worn original gauges. Fresh-looking underneath. Very good looking car with nothing really to knock it for. – This is a beautiful car but the recently added Le Mans package adds more to performance and driving enjoyment than it does to the price. The seller, even after spending a reported $95,000 on the restoration and upgrade, should be highly satisfied with this result. 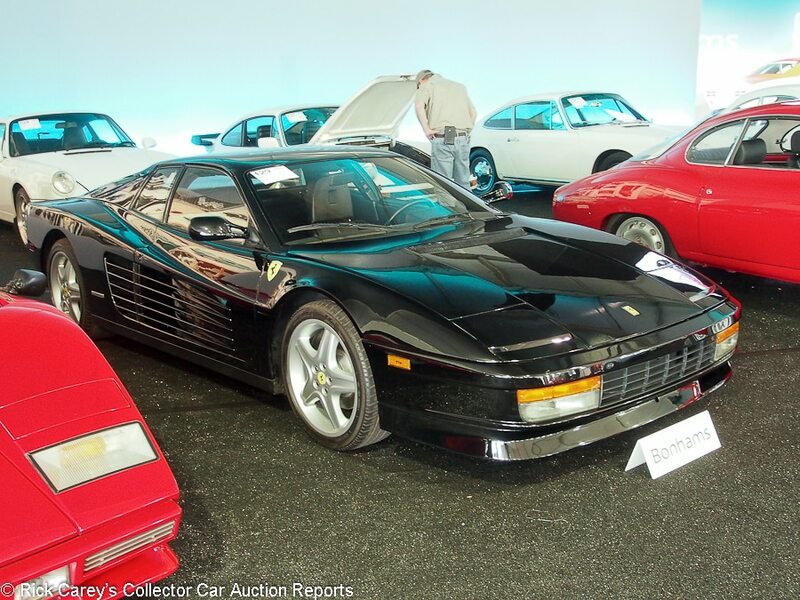 Lot # 129 1988 Ferrari Testarossa Berlinetta, Body by Pininfarina; S/N ZFFSG17A9J0078854; Engine # 15052; Black/Black leather; Estimate $125,000 – $145,000; Unrestored original, 2- condition; No Reserve; Hammered Sold at $73,000 plus commission of 10.00%; Final Price $80,300 – SF shields, later 5-spoke alloy wheels, air conditioning. – Big touchup all along the top of the right front wheel arch, otherwise looks newer than the 24,095 miles on the odometer. 30,000 mile belt serviced last year. – Sold at Branson Spring in 2012 for $64,800, then in 2016 for $104,500, probably without the fender gouge, this is a serious bargain. 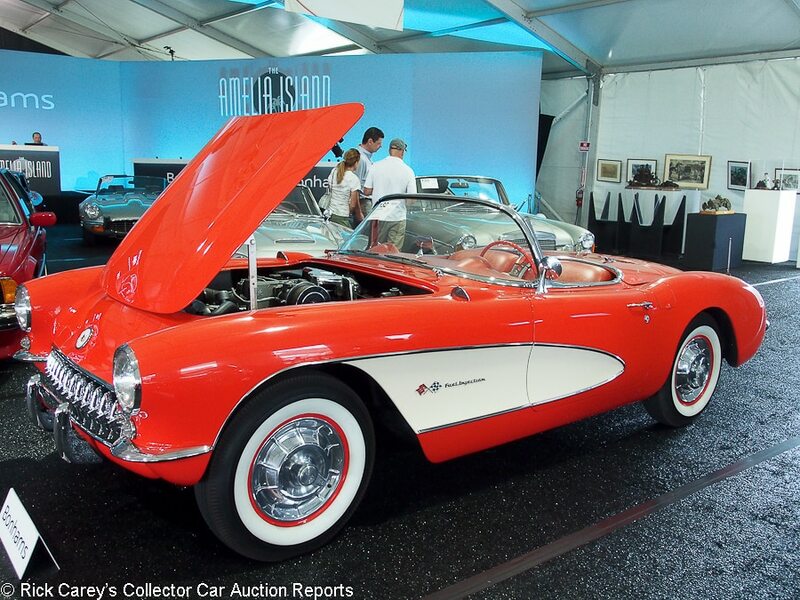 Lot # 132 1957 Chevrolet Corvette FI Convertible; S/N E57S105176; Engine # F612EL; Venetian Red, Beige coves/Red vinyl; Beige vinyl top; Estimate $100,000 – $120,000; Older restoration, 3+ condition; With Reserve; Hammered Sold at $88,000 plus commission of 10.00%; Final Price $96,800 – 283/283hp fuel injection, 4-speed, spinner wheel covers, whitewalls, WonderBar radio. – NCRS Top Flight, Bloomington Gold and represented as completely numbers-matching drivetrain. The paint, chrome and interior are very good, as is the underbody but the consignor was remiss in not spending some time and money under the hood which clearly shows the restoration’s age. 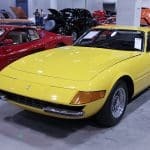 – Neglected isn’t a good term to apply to any collector car at auction, but it applies here and the bidders jumped on the neglect as a sign the seller would let it go well short of the estimate range. They weren’t wrong. With a modicum of attention to detailing the car it’ll jump up significantly in condition and be either a proud acquisition for the new owner or an opportunity to flip it for a meaningful profit. It brought what it deserved, but it could have deserved more with more attention to its presentation. 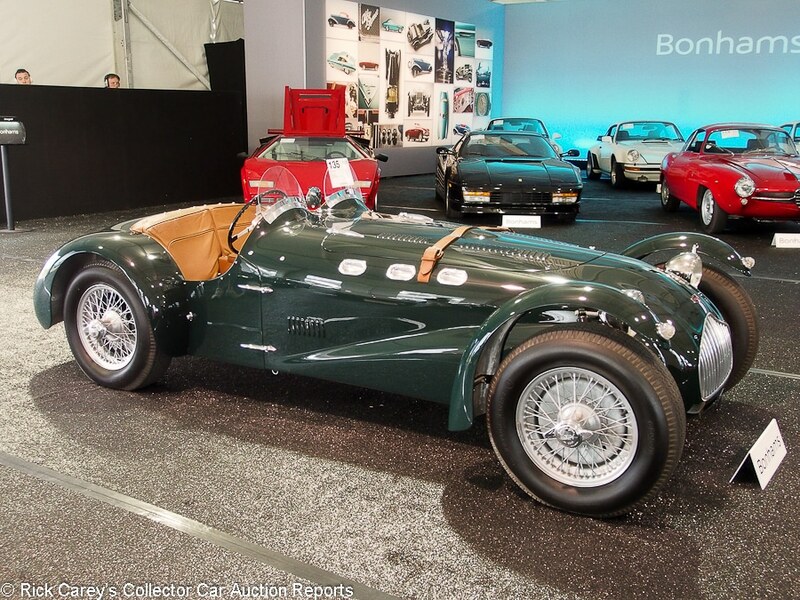 Lot # 135 1951 Allard J2 Roadster; S/N 99J2121; BRGreen/Tan leather; Estimate $250,000 – $325,000; Modified restoration, 2 condition; With Reserve; Hammered Sold at $250,000 plus commission of 10.00%; Final Price $275,000 – RHD. Ford 289/306hp engine, 4-speed, cycle front fenders, Bluemels steering wheel, dual Plexiglas windscreens (original full windshield with wipers included), Hurst shifter, Aeroquip brake lines, silver painted wire wheels, Dunlop tires. 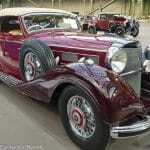 – Excellent cosmetics, new front and rear fenders and upholstery. Very lightly used, but not as it was built. Engine changed to a 289/225hp Ford from the original Ardun ohv Mercury flathead V-8 in the UK in the late 60’s, then upgraded to the present modified 289 Ford in 2011. – Originally powered by an Ardun Mercury, later powered by a stock 289/225hp small block Ford and now this Shelby-spec engine. It was sold by Gooding for an heroic $330,000 on Amelia Island in 2013 and passed at Bonhams Quail Lodge auction last August on a $280,000 high bid. The seller got the message and, y’know what, it’d be worth a lot more with an Ardun under the hood as it was built. The Big Power of the Shelby V8 is somewhat ameliorated by its modest mass and this should be a much better driving car than a Cad- or Chrysler-Allard with big lumps and gobs of torque. But it’s a hybrid and this is real money for it. 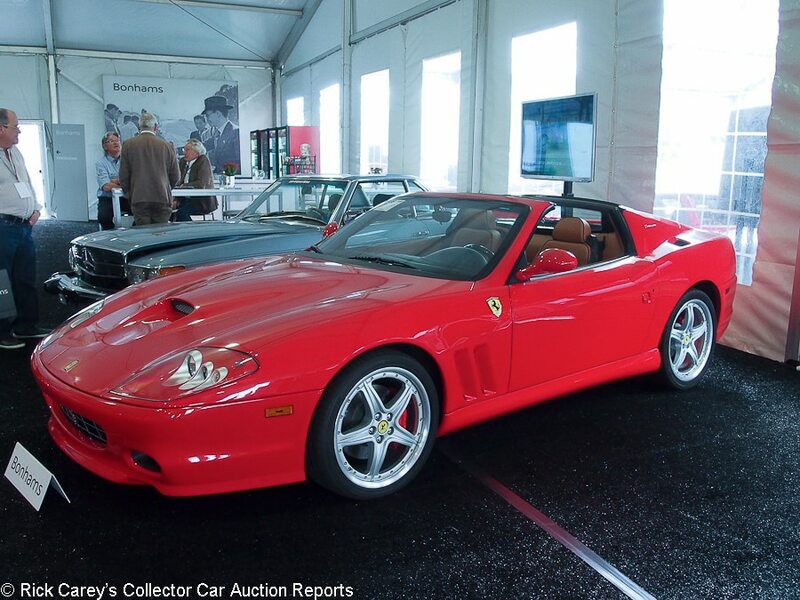 Lot # 138 2005 Ferrari 575M Superamerica Convertible; S/N ZFFGT61AX50145099; Red/Natural leather, Brown piping and Daytona bars; Estimate $400,000 – $450,000; Unrestored original, 2 condition; With Reserve; Not sold at Hammer bid of $340,000 – Red calipers, SF shields, climate control, CD stereo, F1 gearbox, carbon fiber interior trim, Daytona seats, red gauge faces. – Belt change serviced four years ago, essentially unused and pristine. – It would have been unreasonable to move this Superamerica on at the reported high bid, but not a lot. 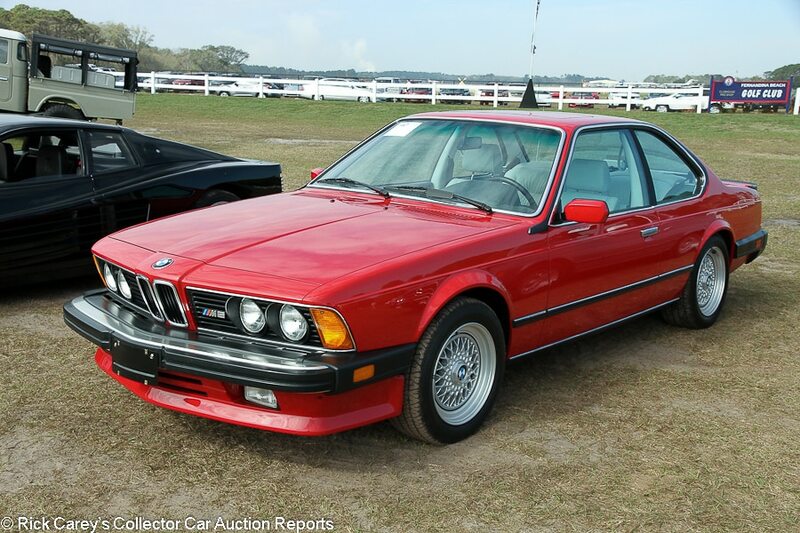 Lot # 140 1987 BMW M6 Coupe; S/N WBAEE1405H2560181; Engine # –; Red/White leather; Estimate $100,000 – $120,000; Unrestored original, 2+ condition; With Reserve; Hammered Sold at $95,000 plus commission of 10.00%; Final Price $104,500 – 3453/256hp, 5-speed, Michelin X tires, power windows, power seats, factory cassette stereo, air conditioning, sunroof. – This M6 racked up a few miles and then sat in a dealer showroom for many years, now showing 6,818 miles total. Everything comes with the car, including the kit to clean the radio and the hand towel that comes with the tool set. Looks like a new car, and just about is. Slight waviness to the dash top is the only sign that this car isn’t brand new. – Bonhams brought two M6s to this sale last year and neither of them did particularly well, but they were nowhere near as good as this one. The M6 of course cost more than the E30 M3 when both cars were new, but the M3 has seriously outpaced the M6 in terms of value growth. This car is a fantastic example, but it’s still huge money with a serious originality premium. It may be a sign of upward mobility for the early M6. 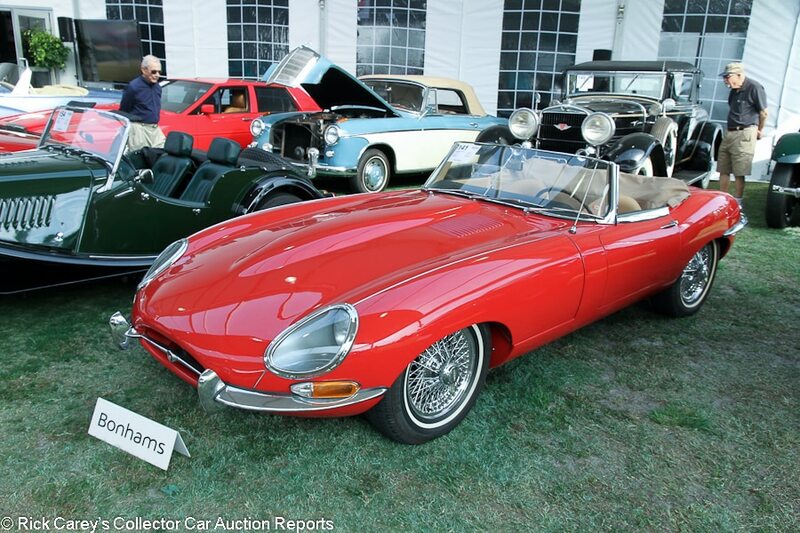 Lot # 141 1961 Jaguar XKE SI Roadster; S/N 876166; Engine # R27749; Red/Tan vinyl; Tan top; Estimate $130,000 – $160,000; Cosmetic restoration, 3 condition; No Reserve; Hammered Sold at $86,000 plus commission of 10.00%; Final Price $94,600 – Centerlock wire wheels, Pirelli narrow whitewalls, tan cloth boot cover, woodrim steering wheel. – Flat floor, welded louver car but with a replaced bonnet with stamped louvers. Originally painted blue. Recently done interior, but the upholstery is vinyl and should be leather. Decent but unremarkable older paint and chrome that were done to a standard before these cars were worth so much. Headlight bezels don’t fit flush. Scratched window and windshield trim. Aluminum trim on the transmission tunnel is a little scratched and the upholstery doesn’t fit evenly around it. Gauges are foggy. Unrestored underneath but the engine was rebuilt in the early 2000s. Showing 71,031 believable miles. It’s surprising to see a Flat Floor Roadster in driver condition rather than a concours queen. – And it is likely that this example, which brought a moderate wholesale price, is headed directly to a restoration shop to be turned out in a year or so in better than new condition. Lot # 142 1959 Bentley S1 Continental Flying Spur, Body by H.J. 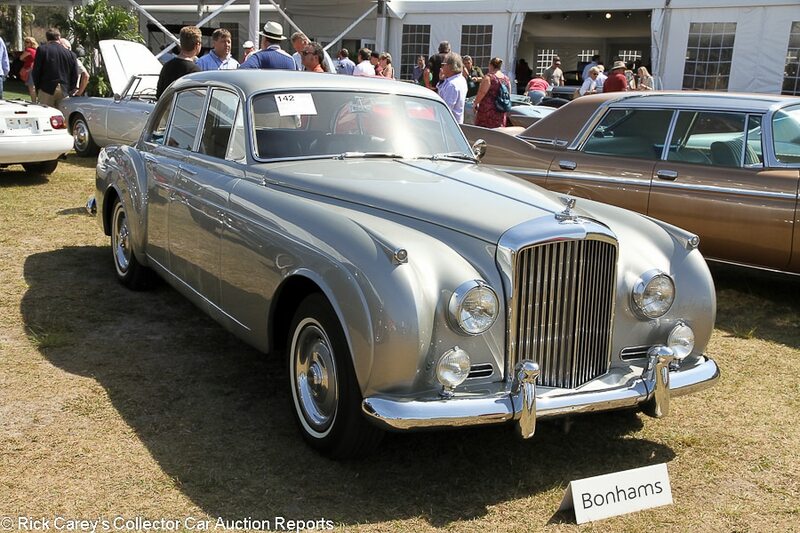 Mulliner; S/N BC14LEL; Engine # –; Silver/Brown leather; Estimate $175,000 – $225,000; Recent restoration, 2- condition; With Reserve; Hammered Sold at $151,000 plus commission of 10.00%; Final Price $166,100 – Wheel covers, narrow whitewalls, Flying B, Lucas driving lights, bucket seats, wood dash and window trim, Smiths dash clock. – U.S. market car. Originally two-tone Sand and Sable over a red interior. Chip at the front of the left rear door. Several small chips and scratches on the tail. Good restored lightly used engine bay and underbody. Mostly very good paint. Slightly uneven door gaps. Interior wood has a few cracks here and there. Otherwise very good interior. A mostly very attractive car but with a restoration that looks older than the 2014 and 2015 work that’s advertised. – Offered by Bonhams in Paris in 2015 with a reported high bid of $131,468, a handsome, exclusive and luxurious vehicle that brought a realistic price. 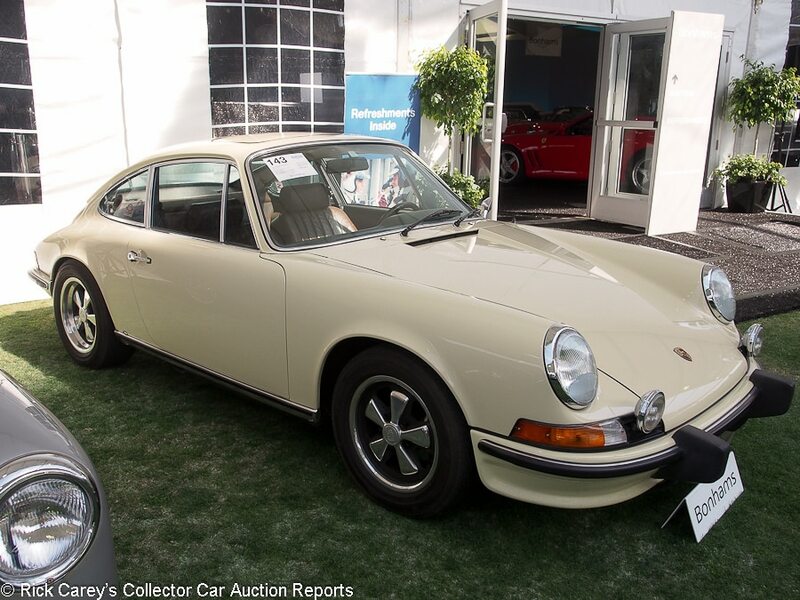 Lot # 143 1973 Porsche 911S 2.4 Coupe; S/N 9113300301; Engine # 6330376; Light Ivory/Brown leather; Estimate $130,000 – $170,000; Original, modified for competition or performance, 3 condition; With Reserve; Hammered Sold at $150,000 plus commission of 10.00%; Final Price $165,000 – 2.7 liter/210hp engine, Fuchs wheels, Yokohama tires, sliding sunroof, Hella fog lights, Momo leather rim steering wheel, Alpine cassette stereo, air conditioning, documented from new. – 142,369 miles from new, engine upgraded to 2.7 liters/210hp in 1988. Very good paint, good original interior with surface cracked driver’s seat. Clean, original, well-used underbody. Slightly grungy engine compartment. – This is a surprising result for a modified and not particularly satisfyingly presented car. Go figure. 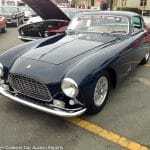 Lot # 144 1955 Ferrari 250 Europa Alloy Berlinetta, Body by Pinin Farina; S/N 0389GT; Engine # 0389GT; Dark Blue/Cognac leather; Estimate $2,300,000 – $2,600,000; Older restoration, 2- condition; With Reserve; Hammered Sold at $2,025,000 plus commission of 10.00%; Final Price $2,227,500 – Chrome spoke Borrani wheels, Michelin Pilote tires, aircraft style lap belts, Marchal headlights and foglights. – Represented as the matching numbers engine block (later heads), body and chassis [leaving some important things out of the representation, not surprising since for much of its life it was powered by a Corvette V8 installed by Max Balchowsky.] One of two Europas built with alloy coachwork, built for the 1955 Mille Miglia but not completed in time for the start. Good older paint and interior, crudely repaired vent window frame and aluminum window trim. Underbody is done like new with age but not many miles showing. Good door seals and window felts. 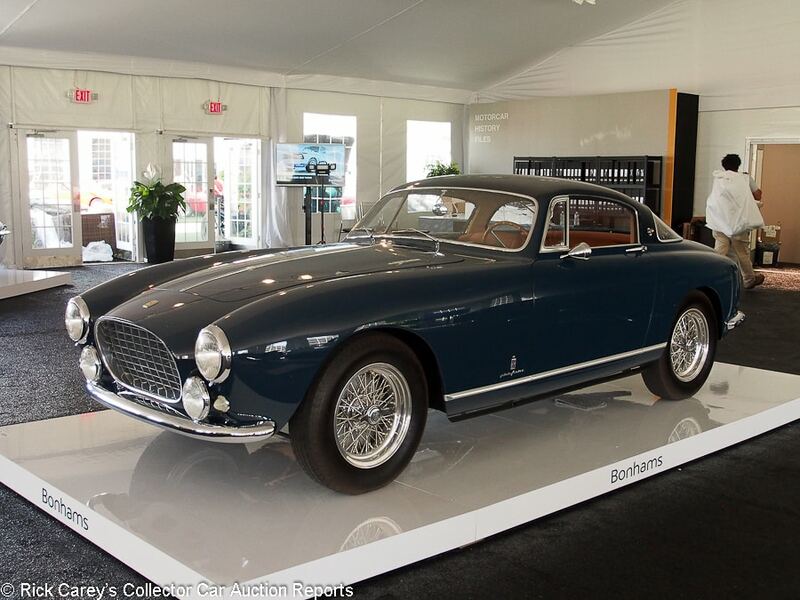 – Offered by Bonhams at Scottsdale in 2015 where it was bid to $2,750,000. It’s not a candidate for Ferrari Classiche in its present configuration but has run the MM Storica and should be a shoo-in for subsequent events. That alone, not to mention the re-fit original engine and alloy body, makes it a superior value at this price. 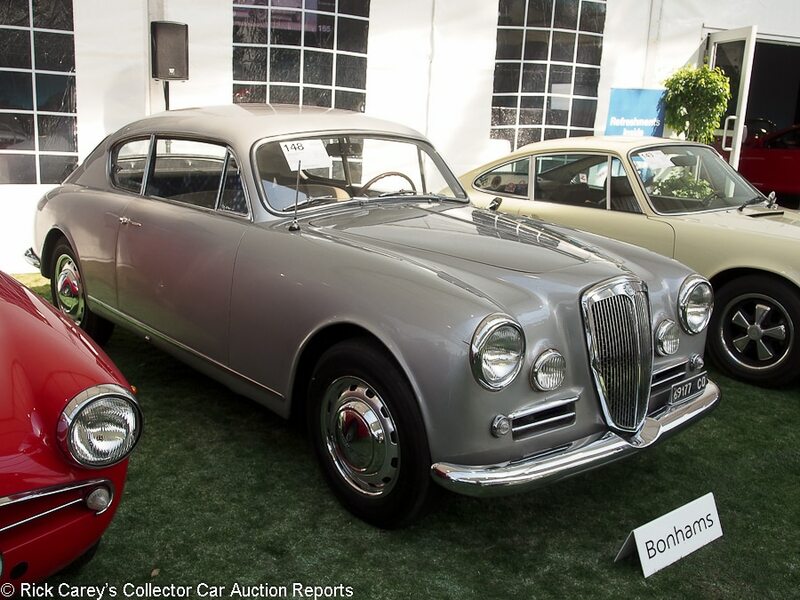 Lot # 148 1958 Lancia Aurelia B20 GT S VI Coupe, Body by Pinin Farina; S/N B20S1832; Engine # B20N5498; Silver/Beige cloth, Blue leatherette; Estimate $110,000 – $140,000; Visually maintained, largely original, 3- condition; No Reserve; Hammered Sold at $92,000 plus commission of 10.00%; Final Price $101,200 – Carello headlights and foglights, Silver steel wheels, hubcaps, trim rings, Michelin tires, woodrim steering wheel, floor shift. – Old, cracked repaint over visible repairs, rust and filler. Fair chrome, dirty original underbody. Sound old and possibly original upholstery. Sound and presentable, it probably can be run as is for several years (after thorough mechanical fettling) before starting the restoration it deserves. – Lancias have never been ‘conventional’ automobiles, pioneering things like independent front suspension (albeit with sliding pillars), narrow angle vee engines and deDion rear suspension. Think ‘Stratos’. The B20 GT may be the ultimate expression before they became Fiat clones and while this isn’t a high performance multi-carb GT it offers unusual performance, style, accommodation and handling in Pinin Farina couture. A GT would cost many times this price, even in similar condtion, making this an astute buy in a ‘I don’t care for convention, this is a great car’ buy. Stand tall, new owner. 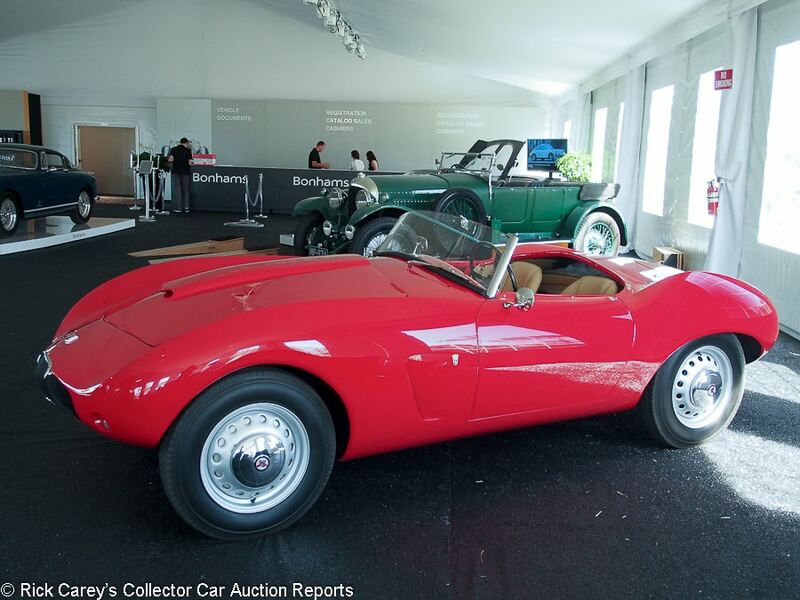 Lot # 150 1954 Arnolt-Bristol Prototype Roadster, Body by Bertone; S/N 404X3000; Engine # 100D754; Red/Beige leather; Beige cloth top; Estimate $400,000 – $500,000; Recent restoration, 2 condition; With Reserve; Hammered Sold at $295,000 plus commission of 10.00%; Final Price $324,500 – Silver steel wheels, hubcaps, Coker Classic tires. – The prototype for the series production Arnolt-Bristols reflecting Franco Scaglione’s creativity in clothing the tall Bristol/BMW six. Raced by Bob Fergus in SCCA in 1954, later Chevy V8 engined. Later 100D Bristol engine fitted with three Solex carbs. Fresh repaint, interior and top. Engine compartment is done, clean and orderly but not overdone and preserves many original features and components. – Collecting owes so much to Stanley ‘Wacky’ Arnolt, not least the Arnold-Bristol of which this is the first, hammered out in Grugliasco by the largely self-taught artisans at Bertone to fit Franco Scaglione’s vision and the distorted form factor of the Bristol chassis and tall engine. It is a piece of Italian coachbuilding history. By any reasonable standard it is a superior buy, on the order of a bargain, when production Arnolt-Bristols have brought half a million recently. Not numbers-matching is of little consequence when talking about the first of the series. 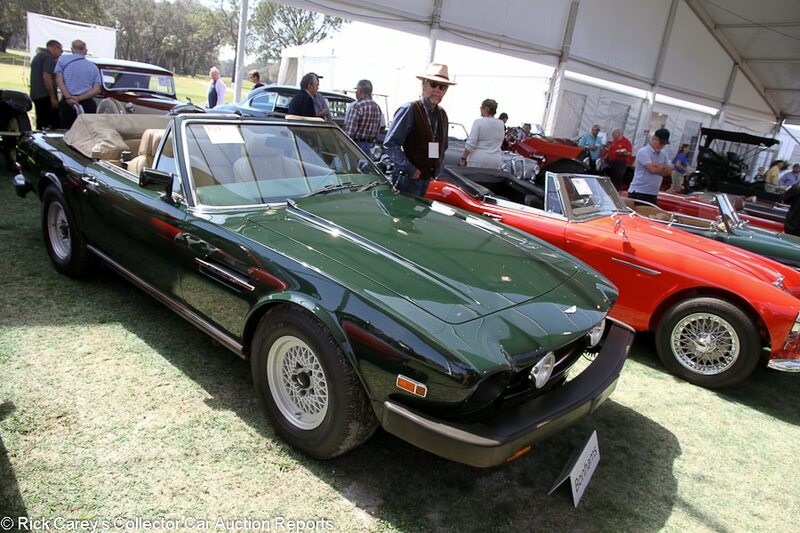 Lot # 151 1989 Aston Martin V8 Volante; S/N SCFCV81CXKTL15770; Engine # V5855770LFM; British Racing Green/Beige leather; Beige top; Estimate $225,000 – $275,000; Visually maintained, largely original, 3+ condition; With Reserve; Hammered Sold at $225,000 plus commission of 10.00%; Final Price $247,500 – 5-speed, BBS wheels, Goodyear Eagle tires, beige leather boot cover, Weber-Marelli injection, wood dash and window trim, dash clock, power windows, air conditioning, factory cassette stereo, heated rear window. – U.S. delivery narrow body, manual shift car. One owner until 2016. Recent major service. Matching luggage included. Paint rub through on the edge of the hood. Very light scratches on the left rear fender. Otherwise very good original paint. Significant wear to the seats front and back. Quite worn switchgear, but the rest of the interior is quite good. Frankly, it could be better given the 17,483 miles showing, but the body style and manual gearbox set this car apart. – Despite being almost thirty years old this V8 Volante is still a distinctive, masculine automobile. Later cars with flared fenders and grimcrackery may fetch more money but this narrow body 5-speed has class and brought a solid price that’s fair to both the seller and the buyer. 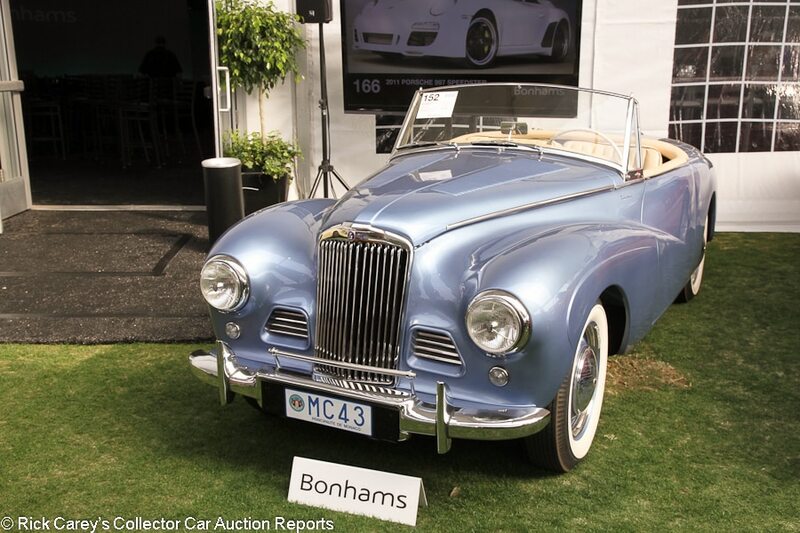 Lot # 152 1953 Sunbeam Alpine Mk I Convertible, Body by Thrupp & Maberly; S/N A3013164; Engine # A3013731LRX; Sapphire Blue/Ivory leather piped in Brown; Tan cloth top; Estimate $55,000 – $75,000; Recent restoration, 2- condition; No Reserve; Hammered Sold at $80,000 plus commission of 10.00%; Final Price $88,000 – 2267/70hp, hub caps and trim rings, Firestone whitewalls, badge bar, Tremec 5-speed with overdrive, Jaeger tachometer, banjo steering wheel. – Restored by marque expert 800 miles ago. Spotless underneath. Paint is fantastic other than a big chip to the right of the grille. Light wrinkling to the seats but otherwise the interior is very good. Door and trunk gaps are a little uneven. Not restored yesterday, but a gorgeous car to look at and showable if not quite a winner. – Originality fetishists might whinge about the floor shift Tremec 5-speed but it will make this 70hp Alpine much more enjoyable to drive and help it keep up with freeway traffic. Fetishists will be happy to know the original gearbox and column shift linkage comes with it, just the thing to clutter up a corner of the garage. This is a superior price for an unusually usable Alpine. 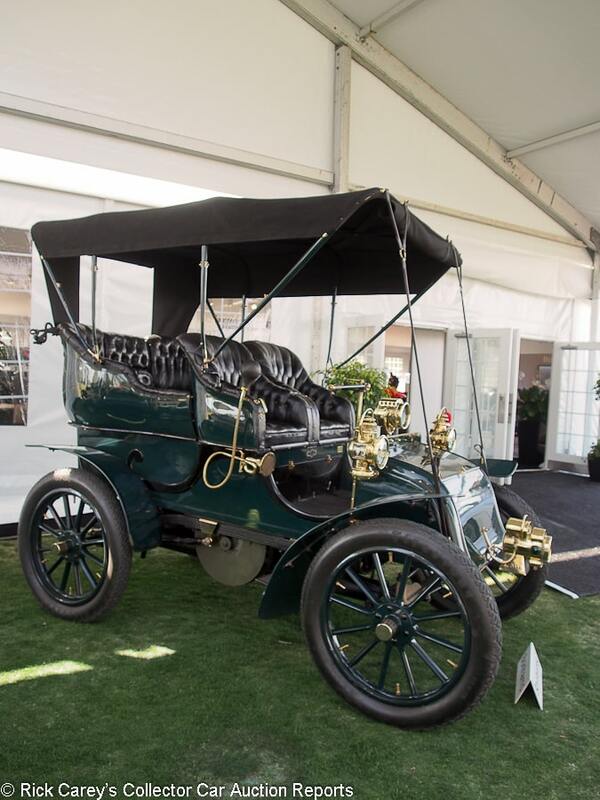 Lot # 153 1904 Knox 16/18hp Tudor 5-passenger Touring; S/N 312; Engine # 839D; Dark Green, Black accent/Black leather; Black cloth top; Estimate $200,000 – $225,000; Older restoration, 2 condition; With Reserve; Hammered Sold at $266,000 plus commission of 10.00%; Final Price $292,600 – 275/16hp opposed air cooled twin, 2-speed epicyclic transmission, lefthand tiller steering, Neverout single acetylene headlight, kerosene sidelights, bulb horn, cowl mounted acetylene spotlight, rear entrance body. – Fascinating engine cooled with approximately 2,000 rods threaded into the cylinders to pull heat from the cylinders. Paint, leather and mechanicals in excellent, barely-used condition. Thoroughly freshened since it was last seen, a 2016 London-Brighton Veteran Car Run where it finished mid-pack without a problem. – The consignor noted that at Brighton last year in sub-freezing weather, the ‘Waterless Knox’ performed like its New England builders intended: flawlessly. 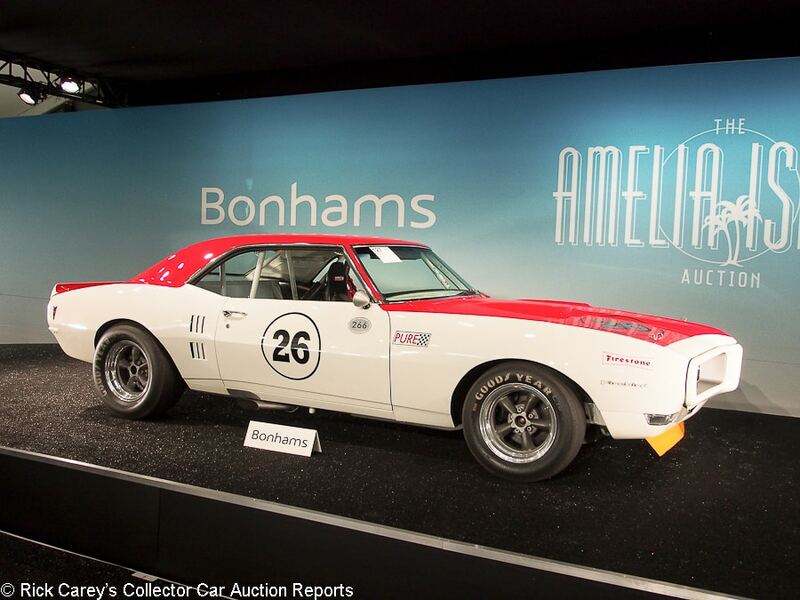 One of the most admired cars in Bonhams’ Amelia Island auction, it exceeded its high estimate by a material margin. It was sold at Gooding’s Pebble Beach auction in 2012 for $180,000, then at Bonhams Qual in 2015 for $192,500: And people ask, ‘Who cares about antique cars?’ This is the answer to that question. It is fantastic, covering many feet between the ‘teufs’ of its 137 cubic inch cylinders which launch it forward in a series of lurches mediated (and perpetuated) by the mass of its huge flywheel. 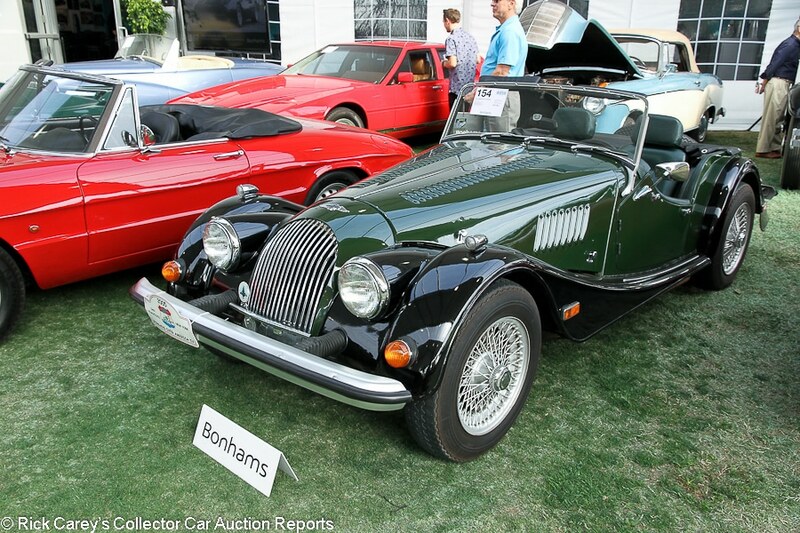 Lot # 154 1981 Morgan 4/4 1600 Roadster; S/N B4921; Engine # –; British Racing Green, Black fenders/Green leather; Estimate $30,000 – $40,000; Unrestored original, 3- condition; No Reserve; Hammered Sold at $24,000 plus commission of 10.00%; Final Price $26,400 – Ford four-cylinder engine, propane powered, painted centerlock wheels, Michelin XAS tires, rear-mounted spare wheel, black vinyl boot cover, badge bar, leather-wrapped steering wheel. – One of the propane-powered Morgans that hasn’t been converted back to gas. Paint is cracking in numerous places, most notably on the hood and the tops of the front fenders. Used and slightly dirty but maintained engine bay. Pitted exhaust tip. Muffler and exhaust pipe are rusty. Very worn but sound seats and the rest of the interior is scuffed up. As an 80s Morgan, the big headrests and the modern gauges make this look a little bit like a kit car. A driver, and not a particularly pretty one. – Morgan resorted to propane power to meet U.S. emission requirements, an expedient that was quickly undone by most owners but that remains an interesting sidebar about small manufacturers struggling to adjust to shifting statutory requipements. It would be a shame to convert it to gasoline now when it will get plenty of attention at British car meets and fascinate other Morgan owners. It’s a sound value in this transaction even with the cosmetic issues that highlight its originality. 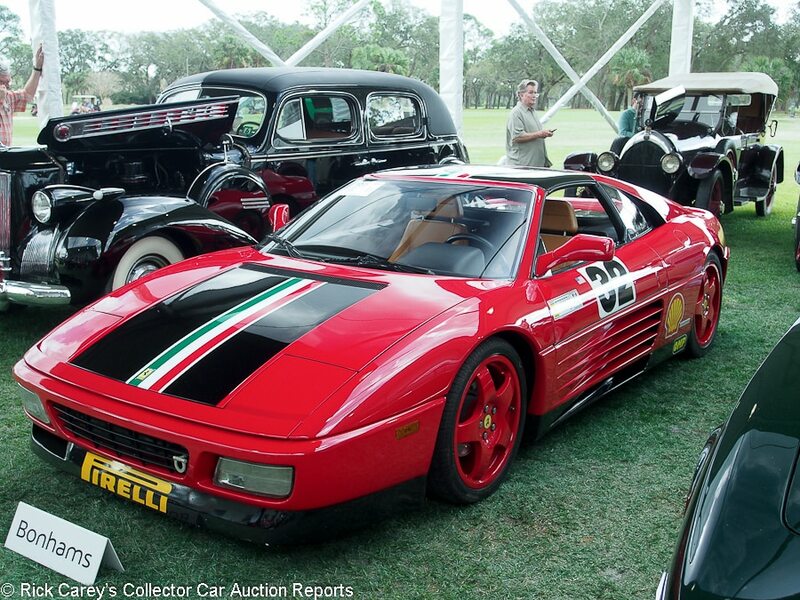 Lot # 155 1990 Ferrari 348 TS Challenge Targa; S/N ZFFFG36AXL0086947; Engine # 23930; Red, Black hood and roof panel/Beige leather; Estimate $60,000 – $90,000; Unrestored original, 3+ condition; No Reserve; Hammered Sold at $40,000 plus commission of 10.00%; Final Price $44,000 – Red alloy wheels, Pirelli PZero tires, power windows, Alpine stereo, air conditioning, tool roll, racing seats, competition belts, roll cage included. – Challenge Kit fitted in 1993, driven by Kurt Carlson, Platinum at Cavallino Classic. Very clean and only lightly used on the driver’s seat but not thoroughly serviced since 2010. – Hi, old friend. This Ferrari was offered at Mecum Monterey in 2009 with a reported high bid of $42,500, at Mecum Indy bid to $37,000, at Kissimmee in 2011 bid to $40,000, at Mecum Monterey 2011 bid to $37,500 then finally sold at Mecum Monterey in 2012 for $37,100. The trendline is pretty flat. 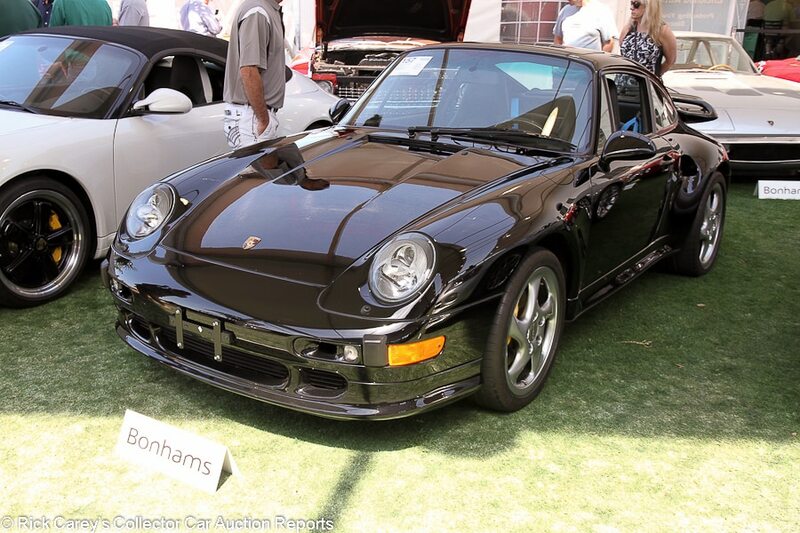 Lot # 157 1997 Porsche 911 Turbo S Coupe; S/N WP0AC2992VS375859; Engine # G1V02146; Black/Black leather; Estimate $300,000 – $400,000; Unrestored original, 2 condition; With Reserve; Post-block sale at $272,727 plus commission of 10.00%; Final Price $300,000 – Yellow calipers, cross-drilled rotors, Michelin Pilot Sport tires, carbon fiber dash and steering wheel rim, VDO dash clock, factory CD stereo. – Two-owner car. One of 183 US market Turbo S models. Service records. Like new despite the 20,131 miles showing. – Hammered not sold at a high bid of $220,000 on the block, then reported sold after the fact for $300,000, which is almost exactly twice what this car would have cost new 20 years ago. It’s lower than other 993 Turbo Ss have gotten at auction recently, though, with the high watermark being Gooding’s $484,000 at Scottsdale last year. Gooding and RM each had a Turbo S in Amelia this year as well, with Gooding’s example not selling at a $310,000 high bid, RM’s selling for $308,000, and the Bonhams car selling for 300 grand on the dot. That pretty clearly defines where the market is currently for these cars. 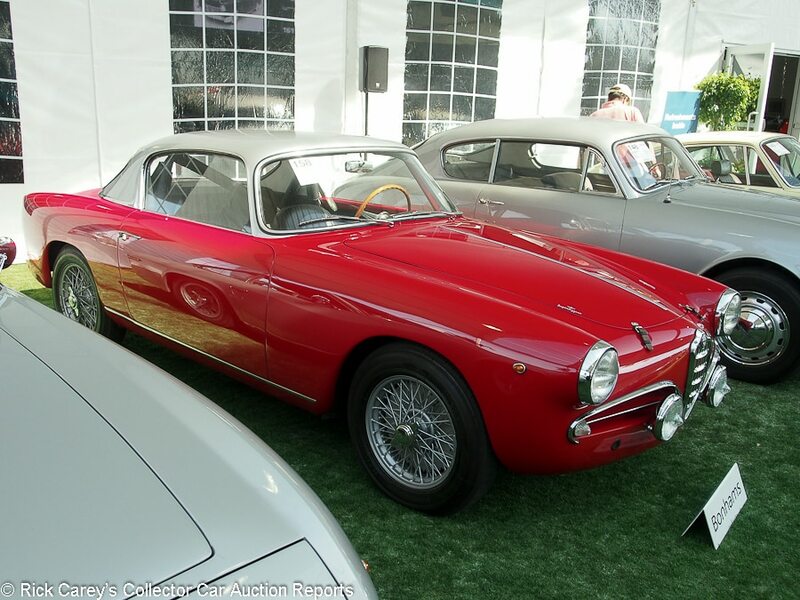 Lot # 158 1957 Alfa Romeo 1900C Super Sprint Coupe, Body by Touring; S/N AR1900C10270; Red, Silver roof/Black vinyl; Estimate $200,000 – $250,000; Older restoration, 2- condition; With Reserve; Not sold at Hammer bid of $175,000 – Alfa 2000 engine, 5-speed, silver painted wire wheels, Michelin X tires, hood straps, Carello headlights and Marchal fog lights, braced rollbar, aftermarket competition seats, no bumpers (original bumpers included). – Very good paint with a few minor flaws and fisheyes. Restored underbody and chassis with some road use. Radio replaced with a clunky switch panel. Restored with an eye to open road events, participated in the 1992 Mille Miglia Storica but acknowledged not likely to be accepted with today’s more restrictive criteria. – Not that it detracts from this Alfa’s appeal for high speed open road events where it promises to be fast, secure and even [relatively] safe. Two Hundred Large, however, is optimistic for what this Alfa is and it could have been let go realistically for the reported high bid. 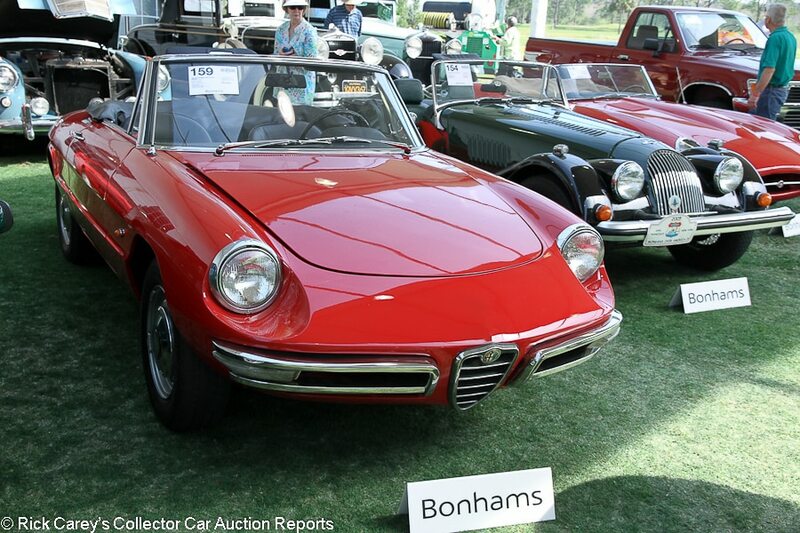 Lot # 159 1967 Alfa Romeo Giulia Duetto Spider, Body by Pininfarina; S/N AR665436; Engine # AR0053611709; Red/Black; Estimate $40,000 – $60,000; Older restoration, 3+ condition; No Reserve; Hammered Sold at $33,000 plus commission of 10.00%; Final Price $36,300 – 1570/109hp, dual Webers, 5-speed, hub caps, Michelin Defender tires, black vinyl boot cover. – Round tail Duetto body. Restored to good driving standards. Clean, lightly used engine bay. Lightly scratched bumpers and headlight bezels. Decent older paint. Older undercoated chassis. Exhaust tip is a little beat up. Gauges look original. Lightly worn original steering wheel. An older basic restoration, probably done before these cars were worth much. – Offering about as much fun as it’s possible to have on four wheels, this is a cost-effective alternative to the now prohibitively expensive Giulia Spiders, let along the Giulia Veloce. A sound little car in decent driving condition that brought a representative price while being a good inherent value. 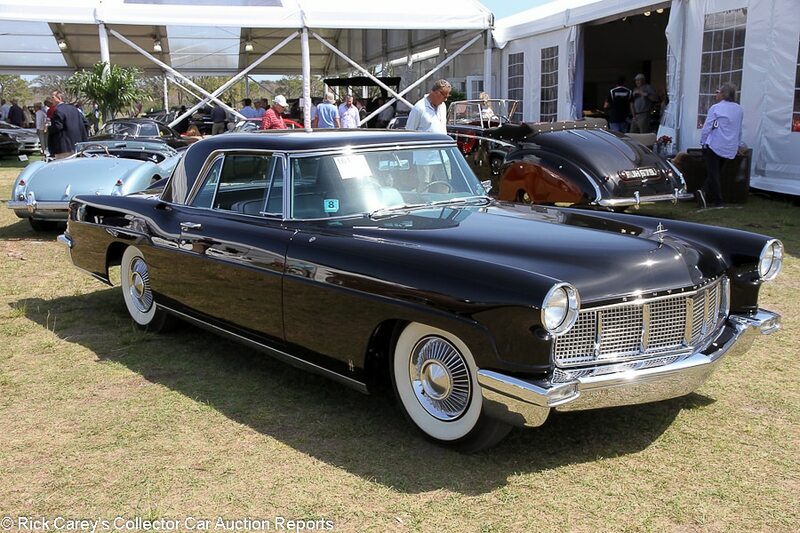 Lot # 161 1956 Continental Mark II 2-Dr. Hardtop; S/N C5601637; Engine # –; Black/Light Blue, Dark Blue leather; Estimate $75,000 – $95,000; Recent restoration, 2- condition; No Reserve; Hammered Sold at $45,000 plus commission of 10.00%; Final Price $49,500 – Wheel covers, Silvertown whitewalls, dash clock, power windows, pushbutton radio, power steering, power brakes, air conditioning. – Owned by the VP of Ford’s International Division. Recently refurbished. Very good recent paint and chrome. Driver’s side door sticks out at the bottom. Original door handles are very scratched. Good original interior with only very light wear to the dash and seats. Restored underneath. – Sold at the Bonhams Simeone sale last year in pieces as an incomplete restoration for $28,600. The result here was fairly cheap for a restored Mk II even with a few flaws, and the hefty purchase price while it was still in pieces last year means that the seller likely took a bath on this one. It was expensive five months ago; now it’s a very good value even if more remains to be done. 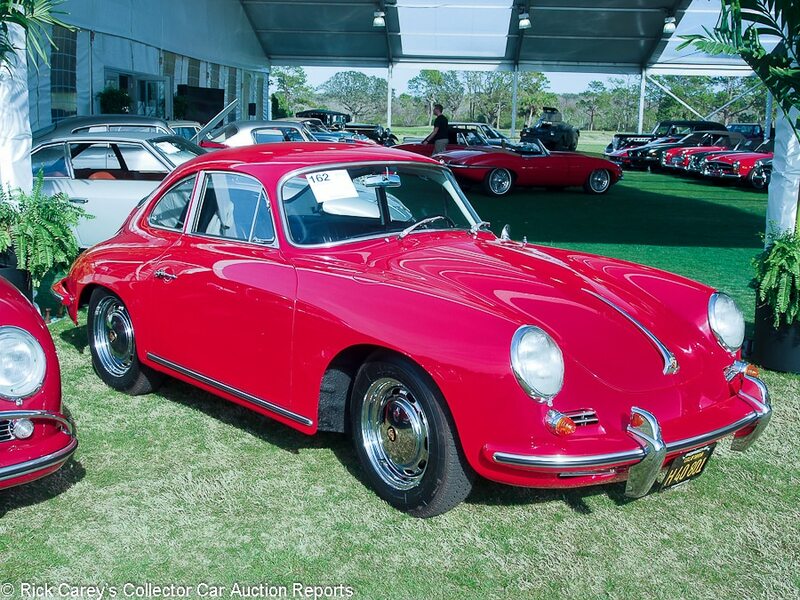 Lot # 162 1964 Porsche 356C Coupe, Body by Karmann; S/N 216431; Engine # P711552; Red/Black vinyl; Estimate $70,000 – $90,000; Cosmetic restoration, 3 condition; No Reserve; Hammered Sold at $84,000 plus commission of 10.00%; Final Price $92,400 – Blaupunkt multiband, chrome wheels, hubcaps, Michelin XZX tires, tool roll, owner’s manual, jack, Porsche CofA documented. – Good looking paint over a generously filled body which authenticates the represented ‘northeast’ history with exposure to rain, snow and road salt. Good interior and chrome. Underbody painted over old peeling, chipped undercoat. Orderly engine compartment is nearly like new. Makes a good first impression that doesn’t hold up. 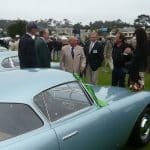 – The bidders didn’t have a paint gauge, nor did they look into the wheel wells. Aside from that, this is an attractive Porsche. Aside from that. 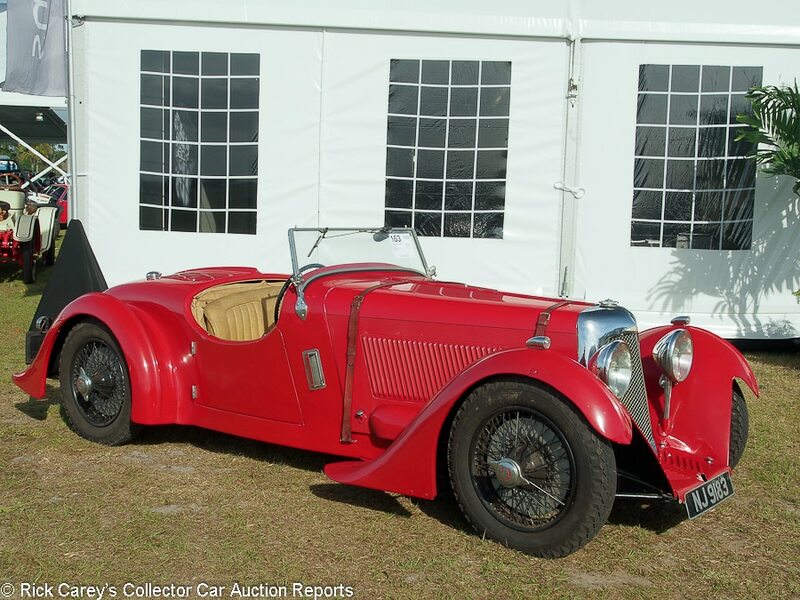 Lot # 163 1935 Godsal Sports Touring, Body by Corsica; S/N 001; Red/Beige leather; Beige cloth top; Estimate $225,000 – $275,000; Visually maintained, largely original, 3- condition; With Reserve; Hammered Sold at $195,000 plus commission of 10.00%; Final Price $214,500 – RHD. 85 hp Ford V8, preselector 4-speed, black wire wheels, Marchal headlights, sliding pillar independent front suspension, Bentley rear axle, folding windshield. – Attractive body with splined front and rear fenders, cutdown doors and splined rear deck. Tired old indifferent quality paint. Soiled original upholstery, stiff old top. Chassis and engine are old and dirty, probably original. The one and only. – A one-of-one unique homebuilt from the UK, but done to more than homebuilt standards. Its history is described with terms like ‘fuzzy memories’ and ‘vaguely recalled’. Period photos from Corsica resulted in the present sweeping fenders being re-created. It’s actually a pretty sweet thing in the style of a Squire or SS100 for not a lot of money. But it’s still a ‘Godsal’ and this is a handsome price for it. Lot # 164 1955 Daimler Conquest Century Drophead Coupe; S/N 90476; Engine # 72978; Silver/Red leather; Estimate $60,000 – $80,000; Recent restoration, 2- condition; No Reserve; Hammered Sold at $32,000 plus commission of 10.00%; Final Price $35,200 – RHD. 2,433cc six, 101hp, pre-selector 4-speed, hub caps and trim rings, dual wing mirrors, Lucas driving lights, dual SU carbs, black vinyl boot cover, banjo steering wheel. – One of 65 built. JDHT certificate. Clean undercoated chassis. Very good paint and chrome. Small dent in the right mirror. Lightly worn original gauges and steering wheel but the rest of the interior is new. Restored only a few years ago. A neat if not exactly beautiful car. – Daimlers often have odd features and proportions, and this Conquest Roadster is no exception with its stubby tail fins and the sheer length of the bodywork behind the seats that measures longer than the hood. It is a wonderful example of the hodge-podge school of British car design with fins, cutdown doors, hood scoops and the tall, fluted Daimler grille. It’s rare and distinctive, but nobody fell in love with it and it fell well short of the ambitious $60,000 low estimate. An astute buy for the new owner, who will never see himself coming the other way in this thing. 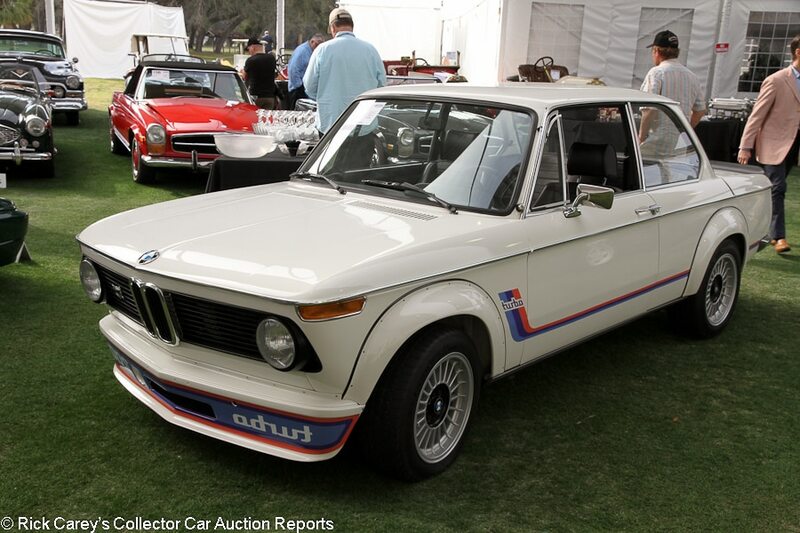 Lot # 165 1973 BMW 2002 Turbo 2-Dr. Sedan; S/N 4291515; Engine # 4291515; White, M graphics/Black vinyl; Estimate $75,000 – $95,000; Visually maintained, largely original, 2- condition; No Reserve; Hammered Sold at $102,000 plus commission of 10.00%; Final Price $112,200 – 1990/170hp, Kugelfischer fuel injection, single turbo, VDO dash clock and boost gauge, Pioneer cassette stereo, air dam, fender flares, alloy wheels, no bumpers. – Built in 1975 but titled as a 1973. Numbers matching. Mostly original. Several big cracks in the bottom of the air dam. Crack in the front edge of the driver’s side door. Light scratches on the windshield frames. Light but long scratch on the driver’s door. Paint looks original and is otherwise very good. Original interior is very good with wear corresponding to the 16,393 km showing. Light road wear underneath and a little dirt in the engine bay but all looks good. Represented as the numbers-matching original engine. Solid preserved example with enough miles to enjoy guilt-free, but few enough that it looks only a few years old. – Just 1,600 2002 Turbos were built, and very few are in the U.S. Any BMW collection would do well to have one of these groundbreaking cars, and this example’s preservation had bidders chomping at the bit enough for it to bring a price that a fresh top-notch restoration normally would, handily exceeding the pre-sale high estimate. 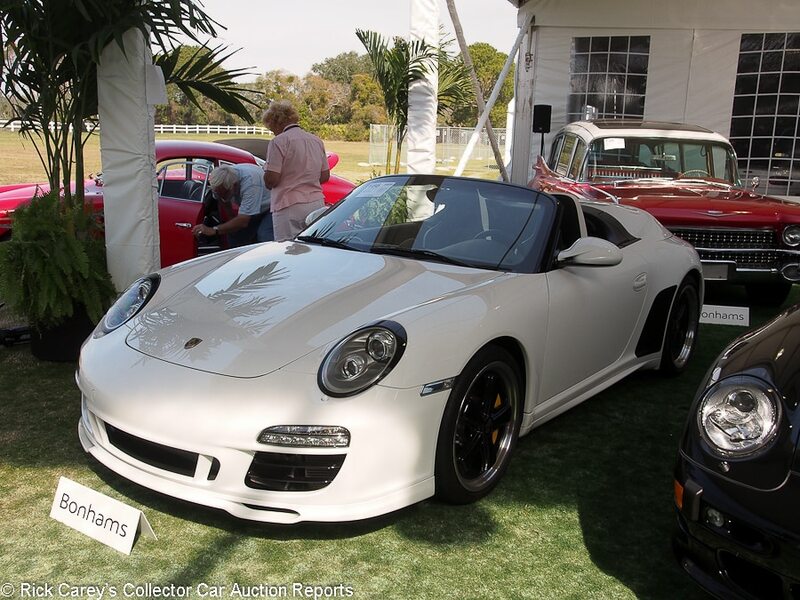 Lot # 166 2011 Porsche 911/997 Speedster; S/N WP0CB2A92BS795608; White/Black, White leather; Black top; Estimate $250,000 – $300,000; Unrestored original, 2 condition; With Reserve; Hammered Sold at $225,000 plus commission of 10.00%; Final Price $247,500 – PDK automatic, air-conditioning, black center Fuchs style wheels, Michelin tires, Yellow calipers, all the Porsche documentation. – 5,500 miles and like new. – A curiously humpbacked automobile with the hard cover for the cabriolet top (like a 540K Cab B) obviating the need for head back windscreens. 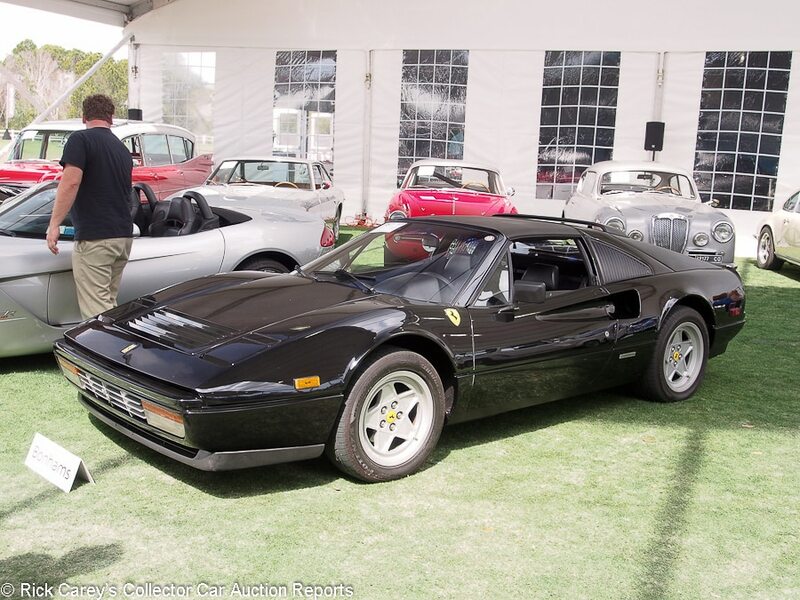 Lot # 167 1986 Ferrari 328 GTS Targa, Body by Pininfarina; S/N ZFFXA20A9G0064209; Black/Black leather; Estimate $80,000 – $100,000; Visually maintained, largely original, 3+ condition; No Reserve; Hammered Sold at $60,000 plus commission of 10.00%; Final Price $66,000 – Air conditioning, SF shields, silver 5-spoke alloy wheels, Bridgestone tires, aftermarket stereo. – 36,874 miles from new, three owners. Clean CarFax. Sound but thick paint, good interior, nearly like new underbody. An attractive driver. – This is a sound and attractive 328 GTS, yet it sold well below its estimate and recent transactions. A hint of coming rationality? 270 hp after all is not nothing exceptional, a stylish cruiser. 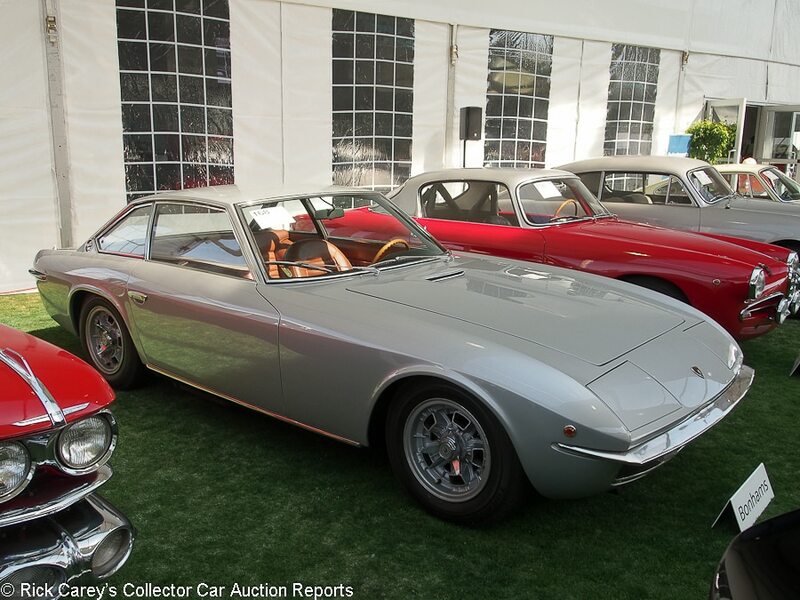 Lot # 168 1968 Lamborghini 400GT Islero 2 + 2, Body by Marazzi; S/N 6318; Engine # 2457; Silver/Tobacco Brown leather; Estimate $250,000 – $300,000; Visually maintained, largely original, 3 condition; With Reserve; Hammered Sold at $225,000 plus commission of 10.00%; Final Price $247,500 – Audioline cassette stereo, two spoke woodrim steering wheel, centerlock alloy wheels, Bridgestone tires. – Clearcoat repaint with a large crack and separating area at the base of the right windshield post. Good major chrome but badly pitted door handles. Sound but surface cracked and creased older upholstery. Original undercoat in the wheel wells. A sound driver with a potentially serious paint issue that needs to be dealt with. – Never ‘restored’ and only intermittently serviced, the ner owner better have a good relationship with a nearby Lamborghini specialist because this long neglected car will need plenty of attention, especially having paid all the money for a quality car. Is this a ‘barn find’ price? It could well be. 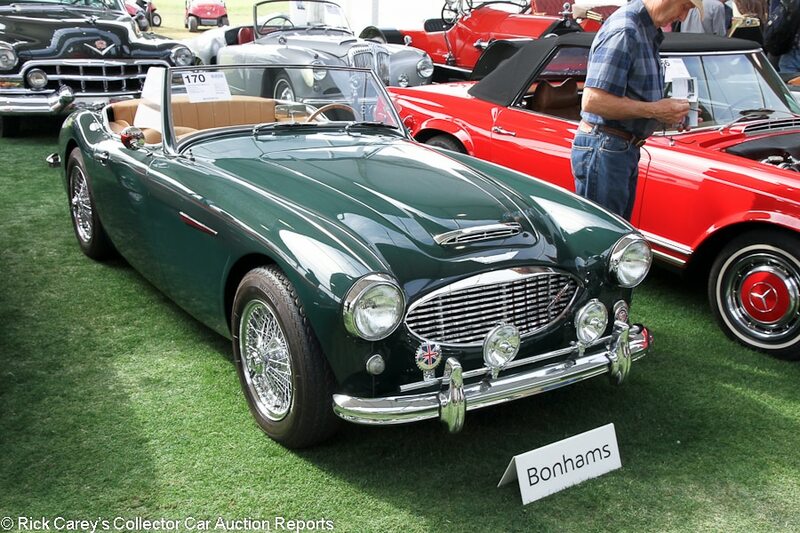 Lot # 170 1960 Austin-Healey 3000 Mk I BT7 Roadster; S/N HBT7L9299; Engine # 29DRVH14569; British Racing Green/Tan leather; Estimate $60,000 – $80,000; Older restoration, 2- condition; No Reserve; Hammered Sold at $41,000 plus commission of 10.00%; Final Price $45,100 – Centerlock wire wheels, dual mirrors, wind wings, badge bar, Lucas driving lights, overdrive, Moto-Lita steering wheel, Smiths heater, digital stereo. – Canadian market car. Restored. Headlight bezels don’t fit flush. Good older paint and chrome. Chip in the paint on the right side of the windshield. Light wrinkling to the seats but otherwise very good interior. Very clean engine bay and underbody. Not done yesterday, but doesn’t need anything. – Sold at Bonhams Scottsdale in 2015 for $56,100. This is a big drop in price after only two years of use with only 26 more miles on the odometer, but this is still fair if more modest money for a used older restoration like this and accurately reflects the 2015-2017 Big Healey market. 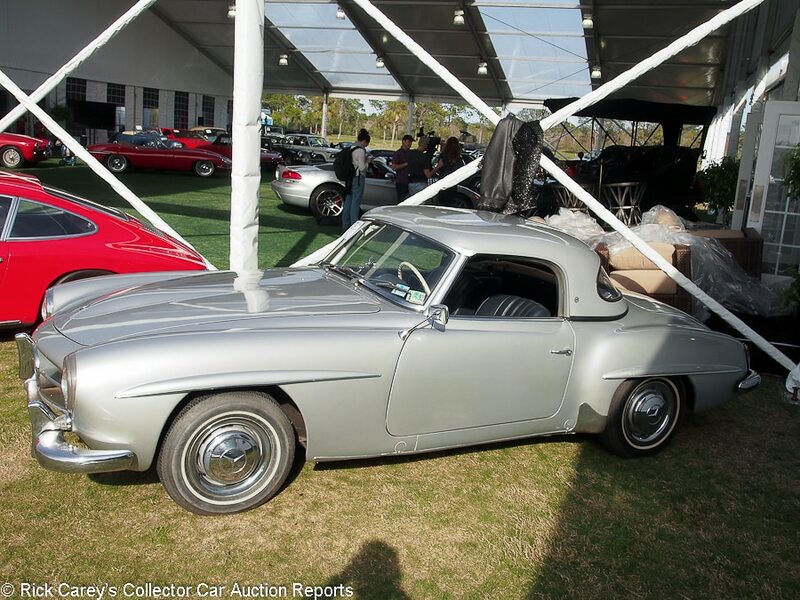 Lot # 172 1960 Mercedes-Benz 190SL Roadster; S/N 12104010016968; Engine # 1219110017060; Silver, Silver hardtop/Dark Blue leather; Dark Blue cloth top; Estimate $60,000 – $75,000; Visually maintained, largely original, 3- condition; No Reserve; Hammered Sold at $62,500 plus commission of 10.00%; Final Price $68,750 – Hubcaps, trim rings, narrow whitewalls, Parrish Plastics hardtop and soft top, Becker radio. – Poor older repaint now with a large flake by the right taillight and a small chip by the left headlight. Chipped door sills and filled right door. Generally poor chrome. Good recent upholstery, cracked steering wheel, old dash and gauges. Grimy original underbody. A restoration project. – The 190SL Rush is over and this is an heroic price for a car that is barely drivable. 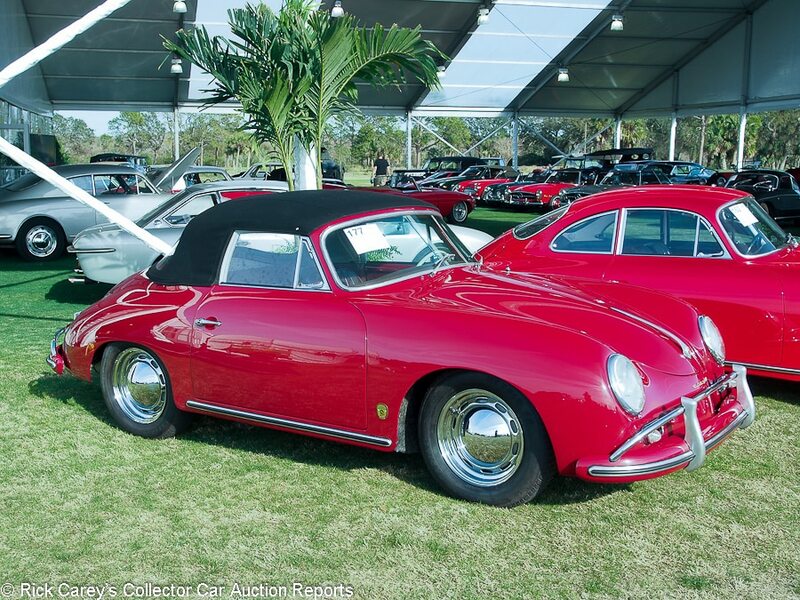 Lot # 177 1959 Porsche 356A Cabriolet, Body by Reutter; S/N 151769; Engine # 607327; Dark Red/Brown vinyl; Black cloth top; Estimate $80,000 – $120,000; Visually maintained, largely original, 3- condition; No Reserve; Hammered Sold at $82,000 plus commission of 10.00%; Final Price $90,200 – Becker multiband radio, chrome wheels, hubcaps, store brand tires, bumper overriders, – Later engine. Freshly repainted over a filled body with some masking oversights. Dull trim chrome, pitted door handles. Good new top. Worn original upholstery with pulled seams in the driver’s seat cushion. Rusty seat frames. Engine compartment has received some attention. Underbody was painted at some point, but over dirt and road grime. – I hesitate to comment on this car which has so many flaws it begs anything in the least complimentary. Replaced engine – filled body – dull trim – tatty upholstery – dirty repainted underbody. The ‘3-‘ condition rating is a gift, as is the price it brought. 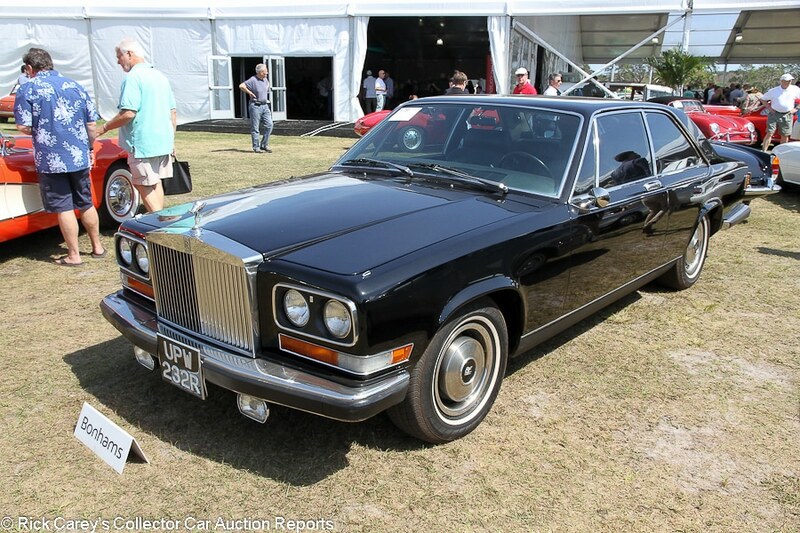 Lot # 179 1977 Rolls-Royce Camargue Coupe, Body by Mulliner Park Ward; S/N JRF30980; Engine # 30980; Black/Black; Estimate $38,000 – $46,000; Visually maintained, largely original, 3 condition; No Reserve; Hammered Sold at $42,000 plus commission of 10.00%; Final Price $46,200 – Hub caps and trim rings, narrow whitewalls, heavily tinted glass, Spirit of Ecstasy, fog lights, Kenwood stereo, power windows, air conditioning. – One of 530 built. Recent brake service. Originally painted two-tone red and black and originally owned by Sammy Davis Jr. Supposedly owned by a mafia boss in New York after that. Decent but kind of tired older paint and brightwork. Tidy and original underneath. Bottom part of the driver’s seat has had the upholstery replaced but the rest of the upholstery is original and significantly worn. Popped seams in the steering wheel rim. Otherwise well kept interior. Showing 59,775 miles. A decent but flawed example of an unloved Rolls model, although it does have Rat Pack history going for it. – The Camargue may wear one of Pininfarina’s least attractive designs, but celebrity ownership caught bidders’ attention and it brought more than a car in this condition ordinarily would. 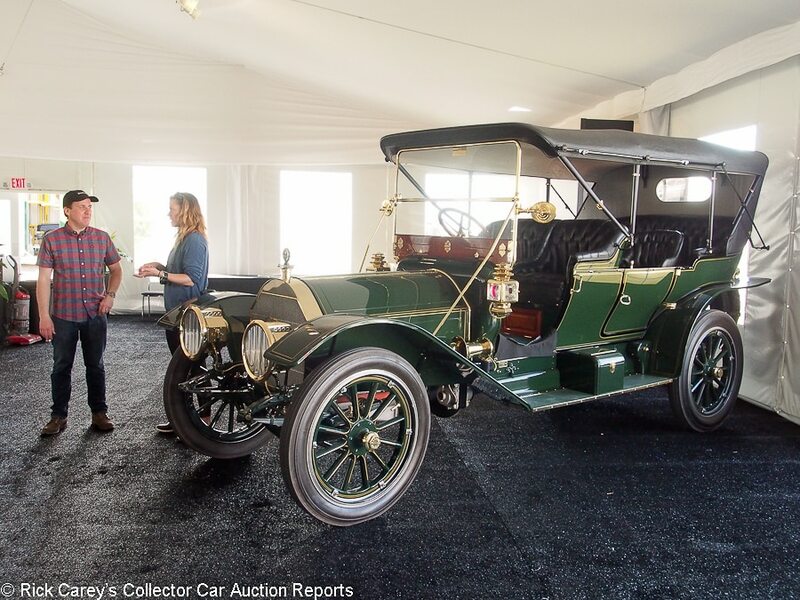 Lot # 180 1911 Pierce-Arrow Model 48 7-Passenger Touring; S/N 9079; Dark Green, Black accent, Gold coachline/Black leather; Black leatherette top; Estimate $550,000 – $750,000; Concours restoration, 1 condition; With Reserve; Hammered Sold at $500,000 plus commission of 10.00%; Final Price $550,000 – RHD. Klaxon bulb and electric horns, electrified Kerosene and acetylene lights, dual rear-mounted spares, jump seats. – Great paint, brilliant chrome, excellent upholstery and top. Concours restored and doesn’t appear ever to have been used except to drive on and off a show field. – A spectacular automobile, restored to the highest standards and maintained to that standard. alive with details of early motoring and, if anything, bought entirely reasonably here. 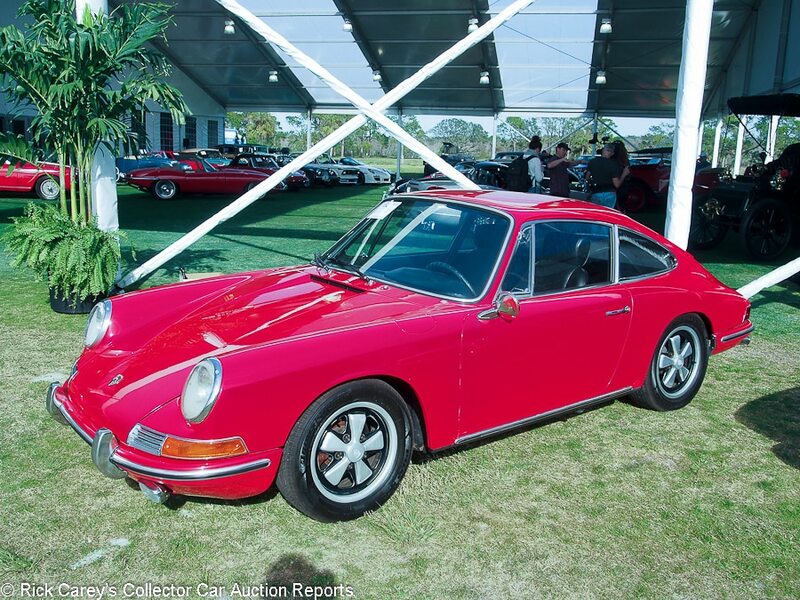 Lot # 182 1969 Porsche 912 Coupe; S/N 462699; Red/Black vinyl; Estimate $40,000 – $60,000; Modified restoration, 3 condition; No Reserve; Hammered Sold at $32,000 plus commission of 10.00%; Final Price $35,200 – Later 914 engine of 1.7 liters, upgraded brakes and suspension, aftermarket headrest seats, Fuchs wheels, Bridgestone Potenza tires, Solex carbs, 4-speed, original engine, seats and interior parts not included. – Said to be about 1.7 liters and 105 horsepower. Decent recent repaint, good seats, dash and gauges. Engine compartment is orderly but not restored, carbs have fuel residue and, there is more than a little road use and grime. Underbody has been repainted over old sealer and is peeling behind the tires. Both sides are filled. – The point of this hi-po 912 is difficult to figure. Is it to demonstrate the potential of Porsche’s four? 105hp doesn’t do that when the most meagre of 2-liter 911s were 130hp. A feeble fantasy, this 912 brought superior money. 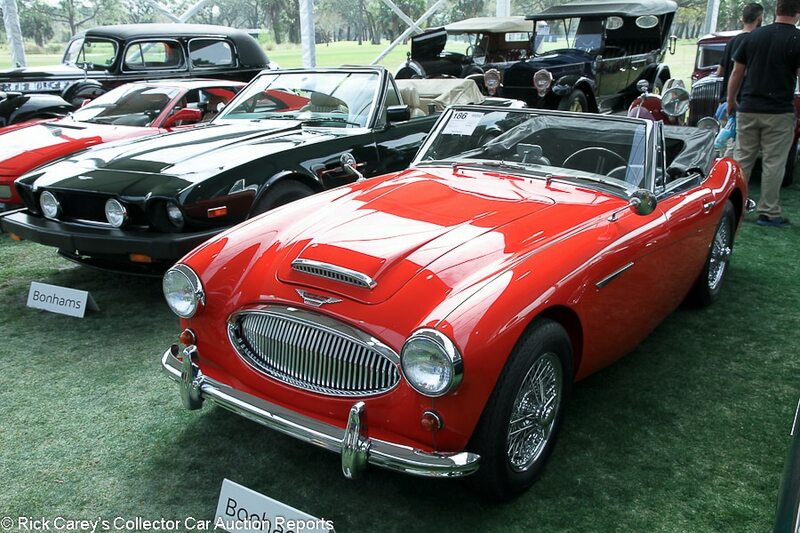 Lot # 186 1962 Austin-Healey 3000 Mk II BJ7 Deluxe Convertible; S/N HBJ7L20605; Engine # 29FRUH1650; Red/Black leather; Black top; Estimate $50,000 – $70,000; Visually maintained, largely original, 3+ condition; No Reserve; Hammered Sold at $32,000 plus commission of 10.00%; Final Price $35,200 – Chrome wire wheels, dual mirrors, black vinyl boot cover, overdrive, banjo spoke steering wheel, Smiths heater. – Good blemish-free repaint from last year. Door gaps are uneven. Light scratches on the rear bumper. Mostly original interior is a little rough. The dash, switchgear and steering wheel are dull and tired. Seats and carpets are lightly worn but sound. Clean engine bay. Never fully taken apart and restored, but has received major work when it needed it and currently presents as a sound driver. 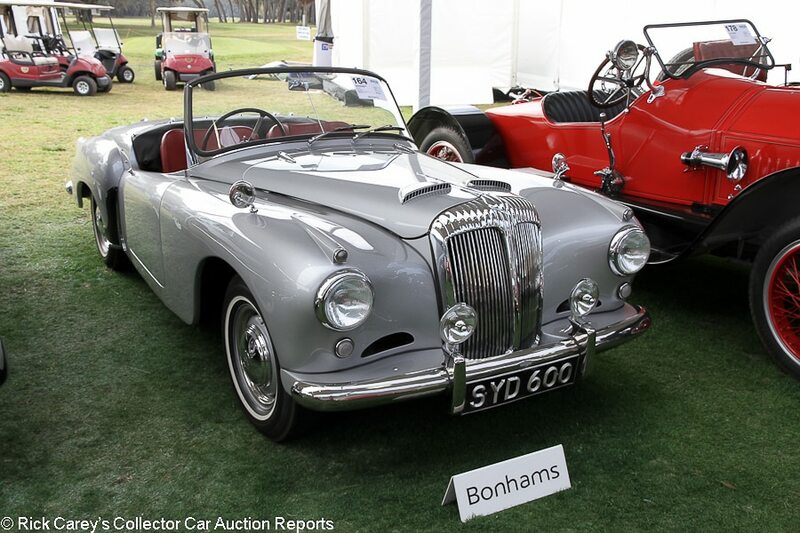 – This sound and usable Healey could have brought another $10,000 without the new owner feeling queasy about the price and is a good value in this transaction. 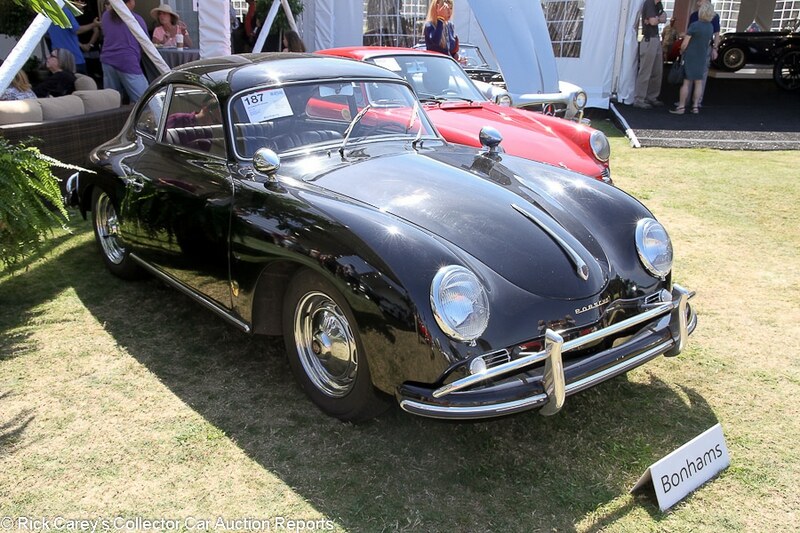 Lot # 187 1957 Porsche 356A Coupe, Body by Reutter; S/N 100288; Engine # 610653; Black/Black leatherette; Estimate $100,000 – $120,000; Visually maintained, largely original, 3+ condition; With Reserve; Not sold at Hammer bid of $75,000 – Dual Raydot mirrors, woodrim steering wheel, radio, gold brightwork. – Represented as highly original. Lots of light detail scratches, chips and swirls throughout. Wheels and brake drums are a little dirty. Good newer upholstery. Original underneath. A maintained but unrestored driver. – A modest but fair offer for a well preserved 356A coupe. The car could have been off to a new home at this price. Contents © 2017 Richard S. Carey and others as their interests appear. Andrew Newton assisted with the on-site observations; final text and comments are the responsibility of Rick Carey.